Breaking news: St. Louis Anarchy arrives at MWR in 2012! 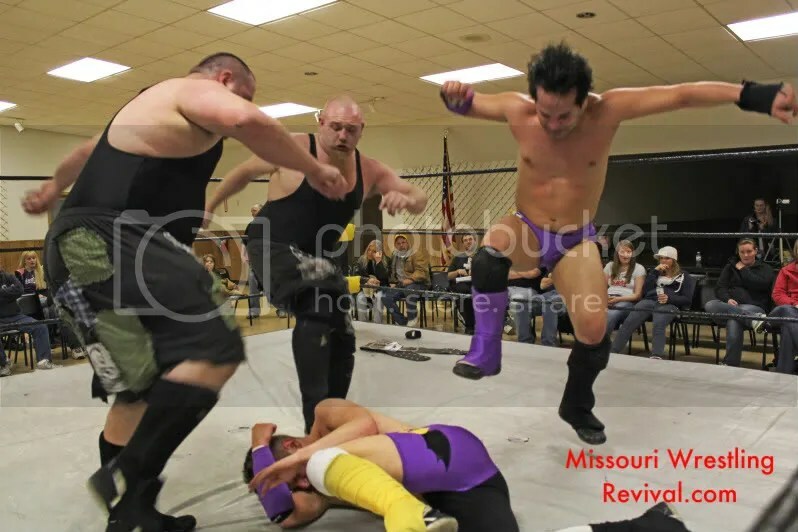 Editor’s note: ST Louis Anarchy can be hard hitting and very violent at times. Their shows are not for the weak of heart and the language can be extreme at times at the shows and in their videos so don’t watch if you are easily offended. With that said, for the fans that have asked us to include this red hot promotion to our site. You now get your wish. 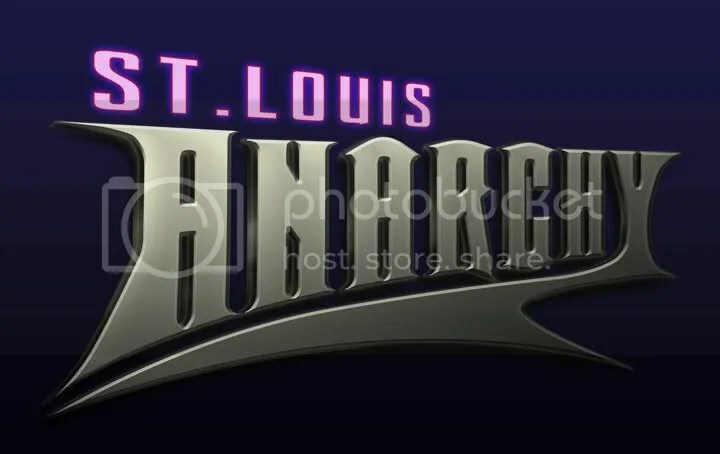 Missouri Wrestling Revival is excited to announce that St Louis Anarchy will be covered on this very site starting 2012 as they will be our 15th promotion in our family. 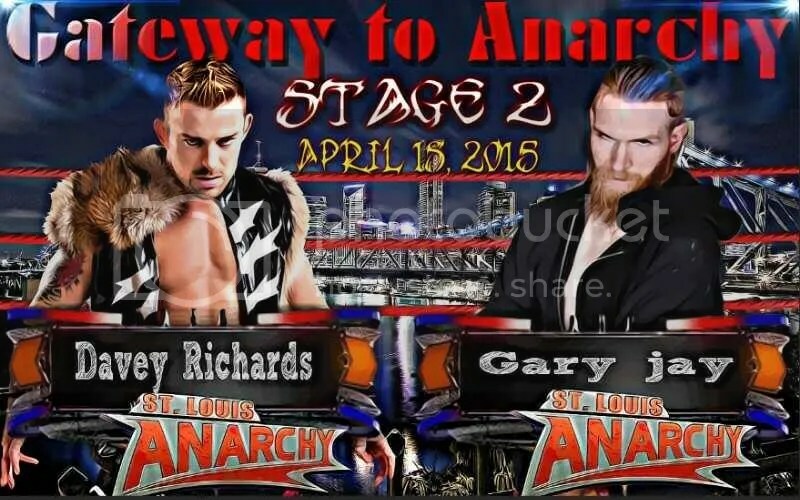 I had the chance to sit down with the head of the STL Anarchy office to discuss where Anarchy has been and what MWR fans should expect when they come to one of their shows or purchase one of their DVD’S through SmartMarkvideo.com. 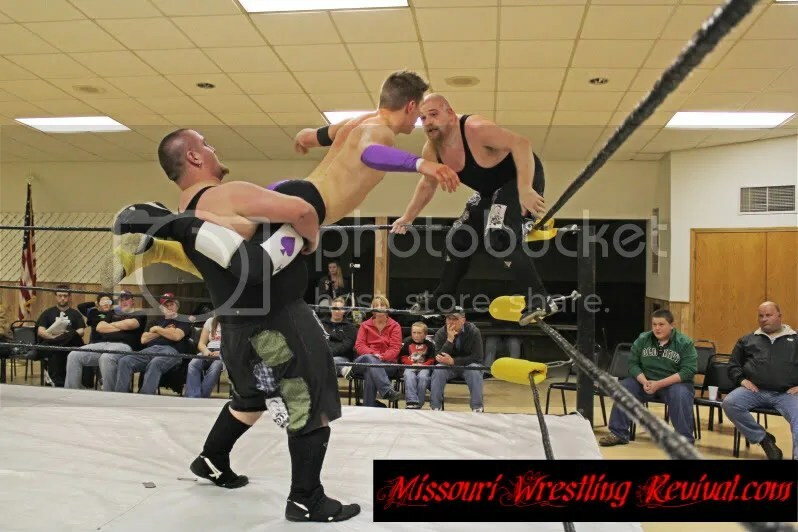 First off let me say thank you for joining MWR today as we try to catch up with the exciting wrestling history of ST Louis Anarchy Pro Wrestling. SLA- We are happy to be a part of your growing website. Thanks for having us. MWR– The fans at MWR will recognize many of the stars of Anarchy such as The Hooligans, the Submission Squad, Shorty Biggs and Evan Gelistico but your promotion is filled with a stacked roster from Anarchy Championship Wrestling of Austin, Texas, as well as many of the top stars of ROH including the current Ring of Honor World Champion Davey Richards. 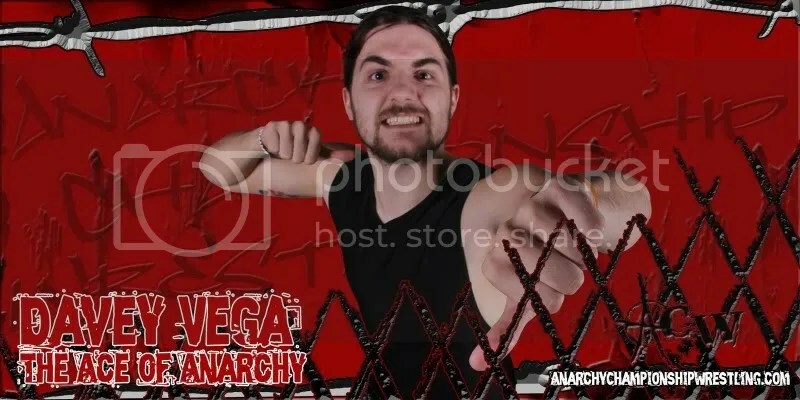 The Anarchy wrestling brand is stationed out of Missouri, Illinois, and Texas through our affiliate company, Anarchy Championship Wrestling (ACW). Please let the fans know more about the history of SLA and what we have missed as we hope to catch up with rivalries in the past of your company and the key players that have made an impact at SLA. SLA– Well when we were the Lethal Wrestling Alliance a group of our guys would travel down to Austin for ACW and every now and then a group of them would come and wrestle for us. The passion of both the offices was the same it was to take wrestling from being looked at as “boring” or “lame” and let more people see what we provide which is extremely fun and well worth the price of the ticket. 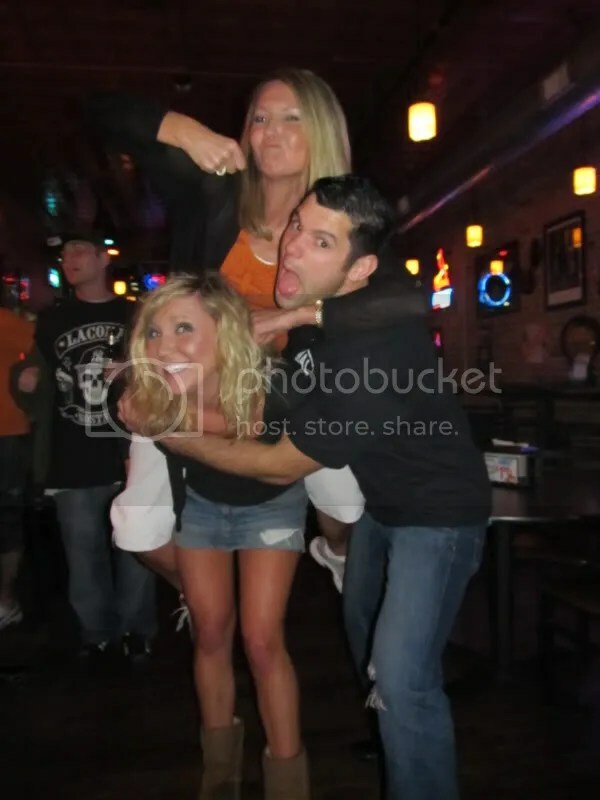 We offer our fans way more than $10 worth of action in Saint Louis as well as Texas. We are about passion and not leaving fans feeling cheated out of their money. Speaking for Saint Louis I feel our stories and in ring action is really second to none. This past year we saw Evan Gelistico and Dan Walsh in a very passionate and bloody battle for the SLA title that saw Walsh become a main event star when he ended Gelisticos 17 month reign dating back to when he was LWA champion. 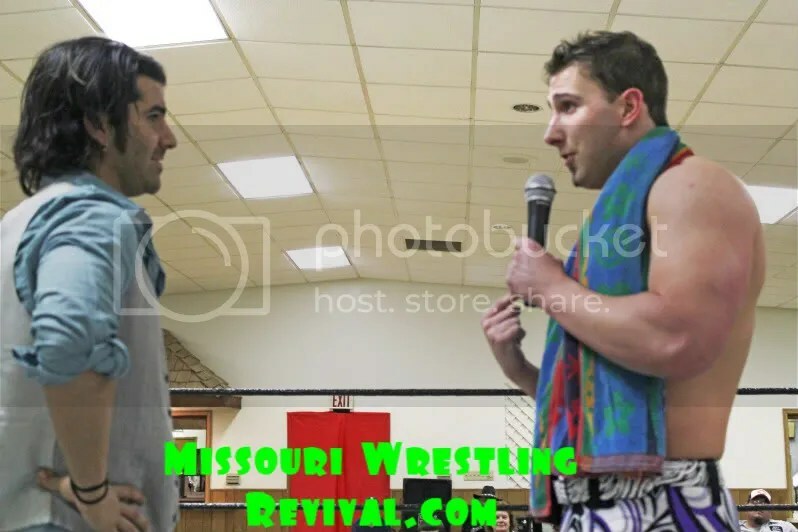 Dingo returned to Saint Louis to battle his student match Fitchett a feud that started as a friendly rivalry and turned very personal leading the bloodiest match I can remember at Yuletide Terror. 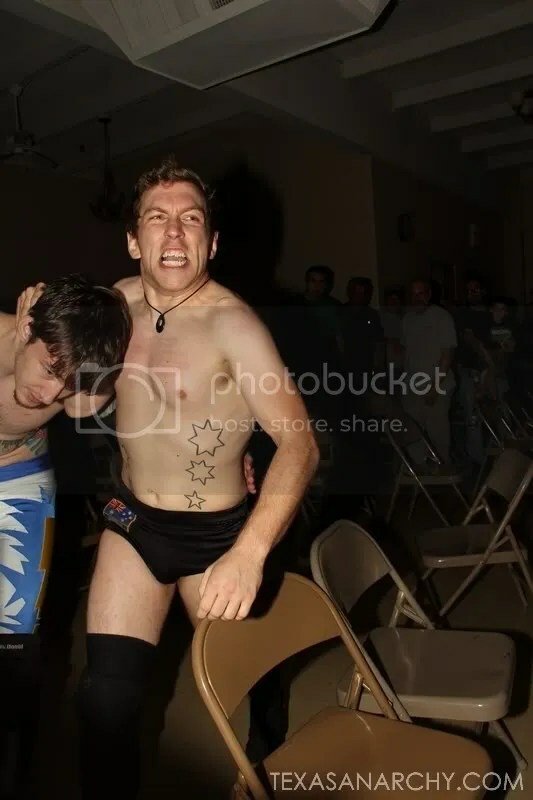 Davey Vega went from ½ of a tag team to a legit guy on the Indy’s have five star matches with Davey Richards, Johnny Gargano and Kyle O’ Reilly. Gerlard James and ACH have been at each other’s throats for the whole year and that feud will come to a head on January 15th in Austin Texas. Those are the main things going on there’s so much more but I would be talking all day. 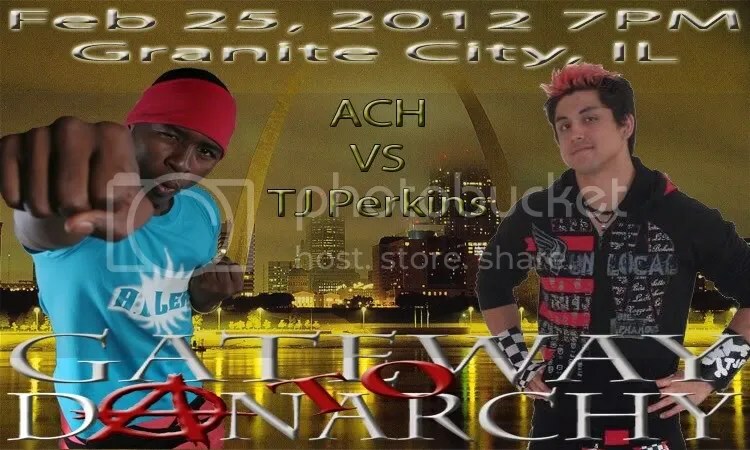 MWR– St Louis Wrestling Anarchy returns to action on February 25th in in Granite City Illinois with “Gateway to DANarchy” at the Rivers Edge Complex. 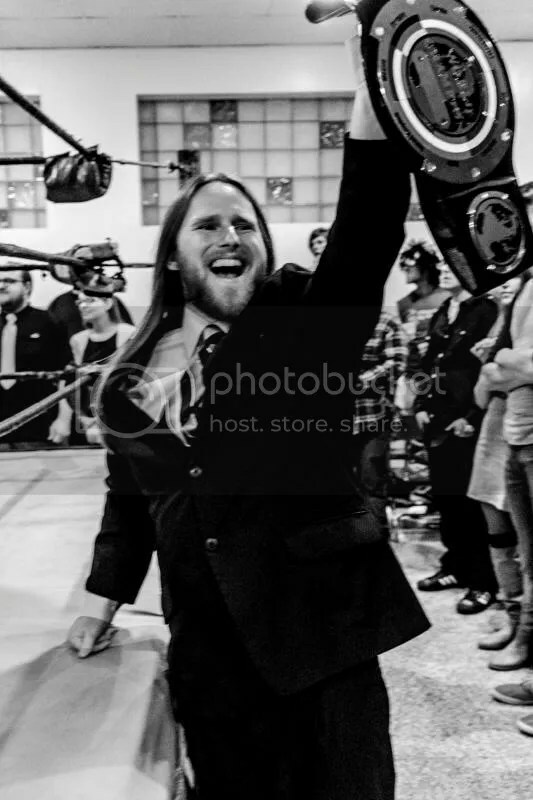 New Saint Louis Anarchy champion Dan Walsh will defend the title against Darin Corbin, formerly one half of the 2008 MWR Tag Team of the Year, the Northstar Express. Corbin teamed up with Robert Evans to upset (Team Ambition) Davey Richards & Kyle O’Reilly in tag action. 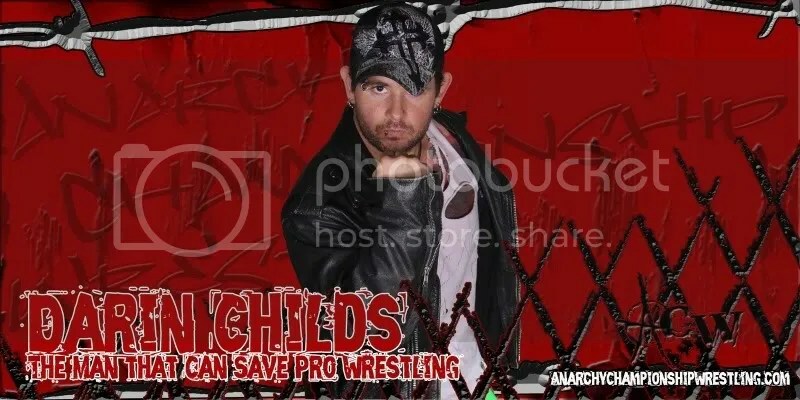 Rookie sensation Mat Fitchett and Davey Vega look to defeat Davey Richards and Kyle O’Riley to continue Richards and O’Riley’s losing streak at Anarchy. 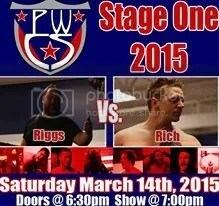 Even with the talent of Fitchett and Vega, that should be easier said than done as Richards and O’Riley hate to lose. Both of these two matches should be hard hitting, for sure and are easily worth the price of admission. 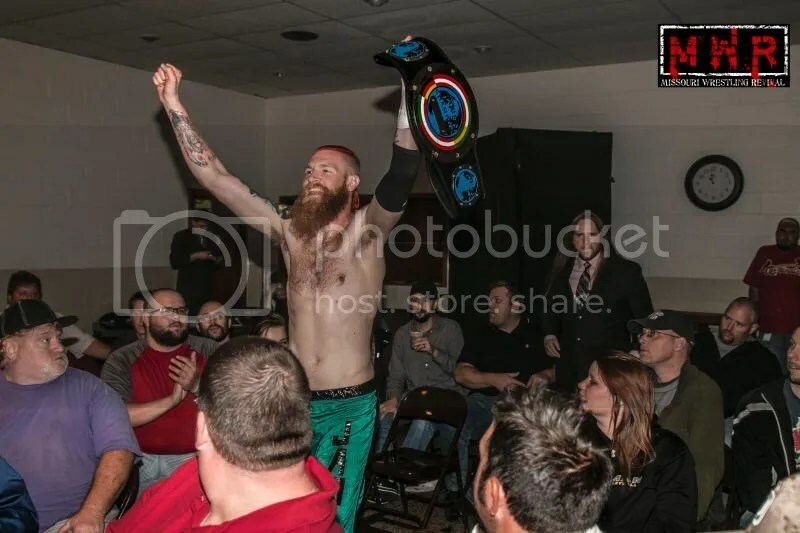 How do you see Corbin’ strategy as he chases his biggest singles title in his career since he last won the IWA MID-SOUTH title during their glory days on January 21, 2006 against mentor Arik Cannon? 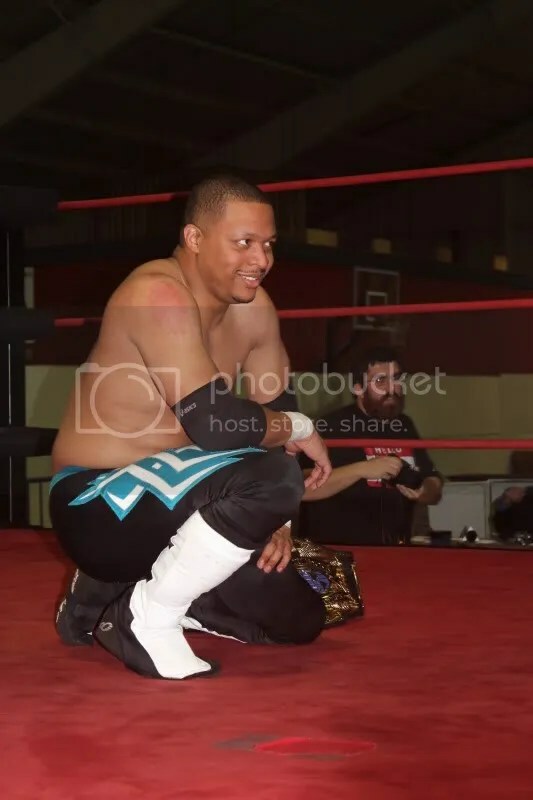 SLA– Darin Corbin is a guy who gets tight casted as a comedy act or a sidekick when really he is a great in ring competitor. All of 2011 Corbin has stepped up to show SLA fans that he is the real deal and I am very proud of what he’s done this past year. Walsh went through hell to win that belt and he isnt going to let it go because Corbin had a great 2011. Corbin has the road miles and experience on Dan but I dont think he can out brawl him. I think its going to come down to who can throw who off there game plan. 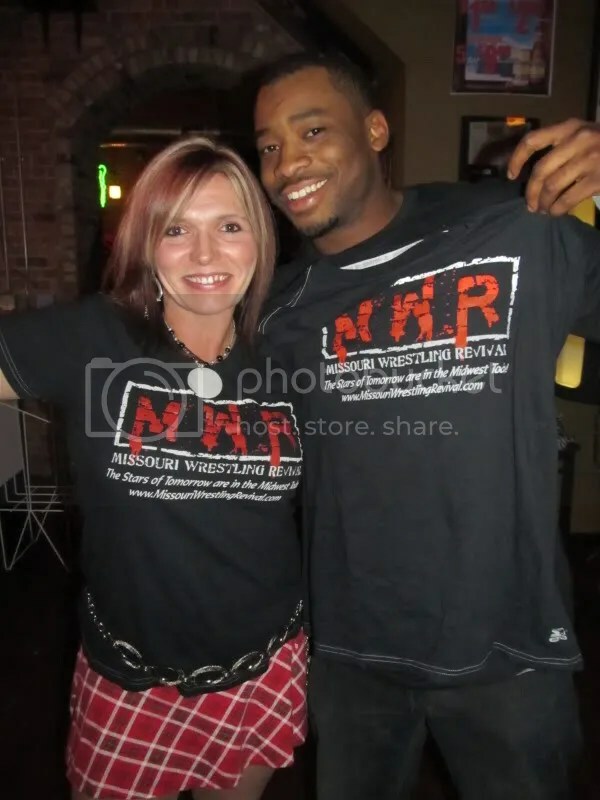 MWR – We mentioned the stars that are fans at MWR are familiar with but for a moment let’s take the time to shed light on the stars from Anarchy in Texas and beyond that have not been featured at MWR in the past. First off the ACW Champion, ACH and what is the history of the ACW title and who did ACH defeat for the title? SLA- The ACW title has a very rich history. Some of the very best pro wrestlers in the world have held that title. From Jerry Lynn to Jimmy Jacobs to Showtime Scott Summers. ACH won the title by winning the 2011 Lone Star Classic. He won the finals by pinning JT Lamotta. 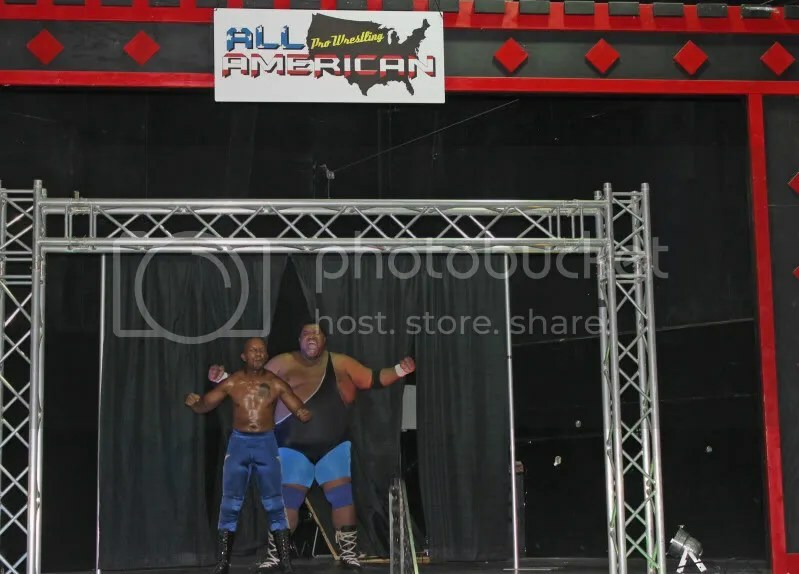 However Gerald James attacked him and took the title and trophy from him which is why they will meet at ACWs flagship event Guily by Assocation 6. SLA– Rachel is one of the best wrestlers on our roster. See how I said wrestlers and not “female” wrestler. Yes Rachel is a female but inside the ring she will knock you out rather you are a man or a woman. 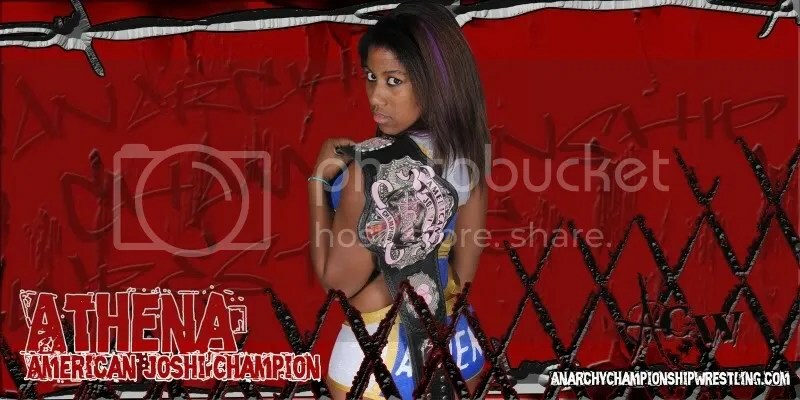 We dont put labels on people when you are in Anarchy you are a wrestler plain and simple. 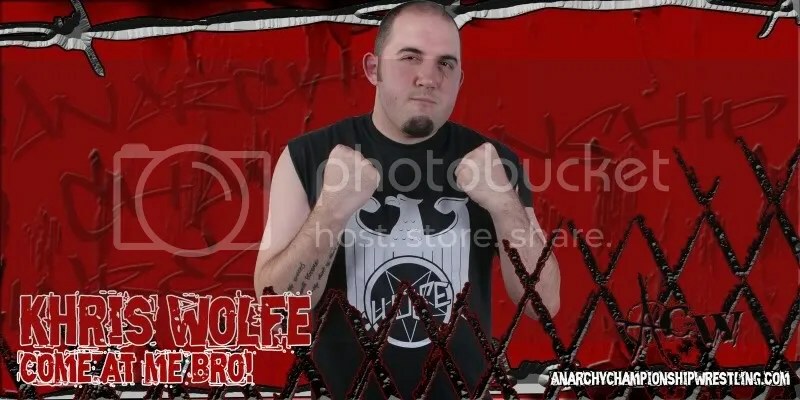 SLA- Wolfe is a student of the Necro Butcher and really came into his own in 2011. He has some killer strikes and a variety of suplexes. He also is not afraid of the “death match” game winning several of them is his career. One of the most under rated guys in Anarchy. SLA – Feb. 25th will be his first time that Perkins is coming to the world of Anarchy. 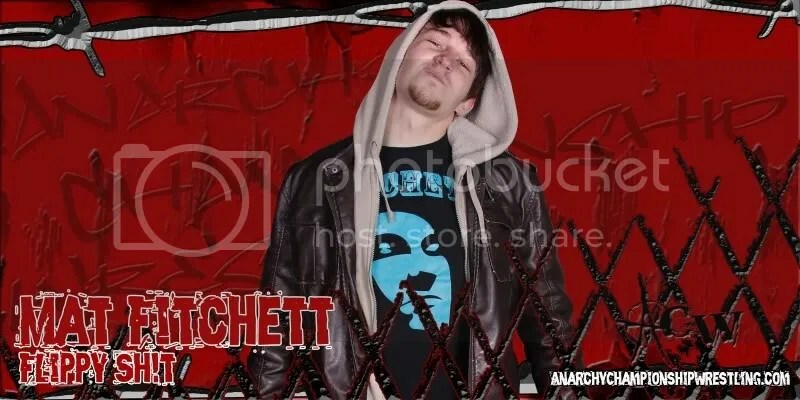 Perkins is one of the best well rounded wrestlers in the world and I am excited to see him in Anarchy. SLA– The King of Monarchy. Evans is one of the most entertaining guys I have ever seen preform. 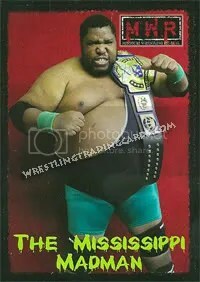 He is a former ACW heavyweight and U-30 Champion. 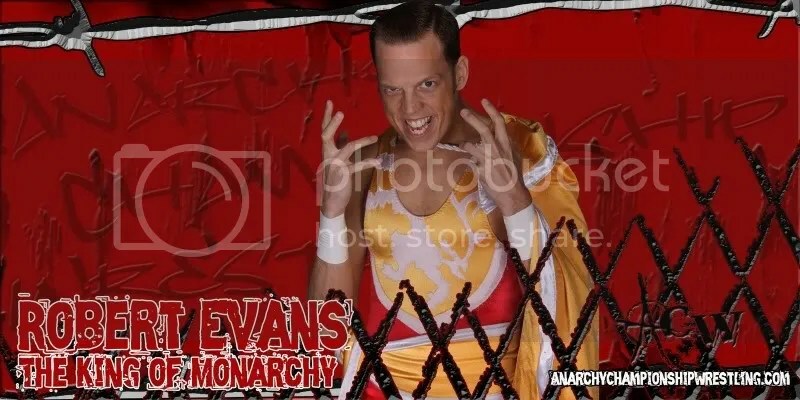 Evans ring entrance is worth the $10 ticket alone. If you dont believe me just ask his legion of fans in Austin Texas. SLA– Darin outside the ring is the main reason that there is a Saint Louis Anarchy. 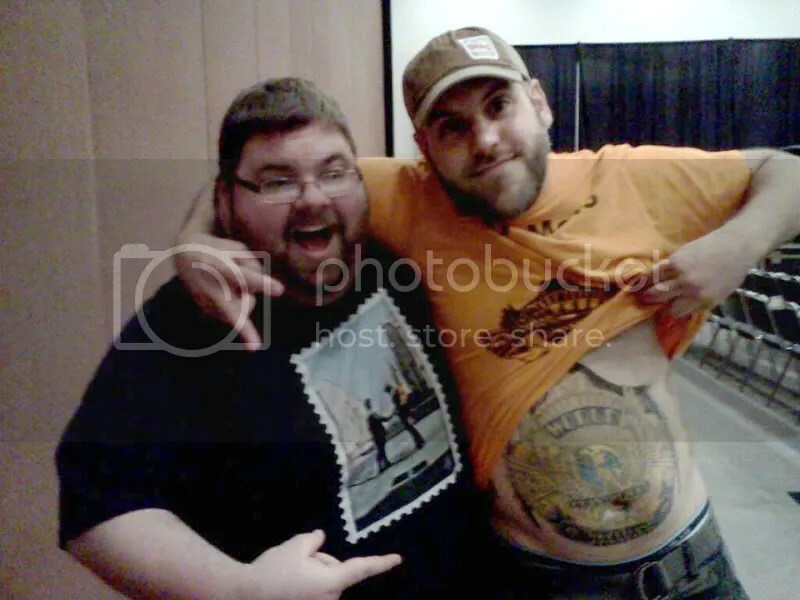 His passion and drive for ACW is a lot of the reason we asked about doing this in Saint Louis. 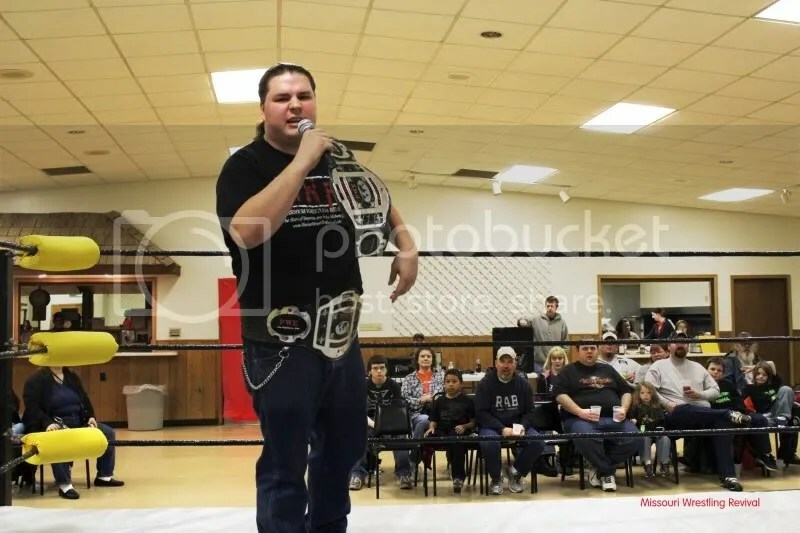 As far is in the ring this is a guy who dropped over 100lbs and is a former ACW Champion. 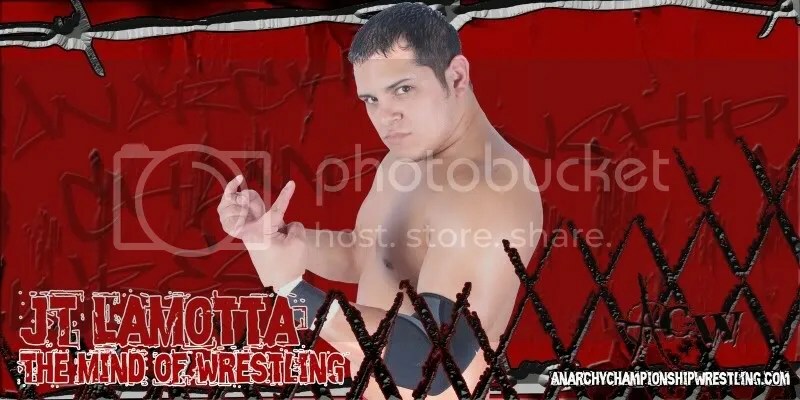 He competed with Davey Vega in a no rope barb wire match that was just awsome. SLA– ACH is flat out amazing. 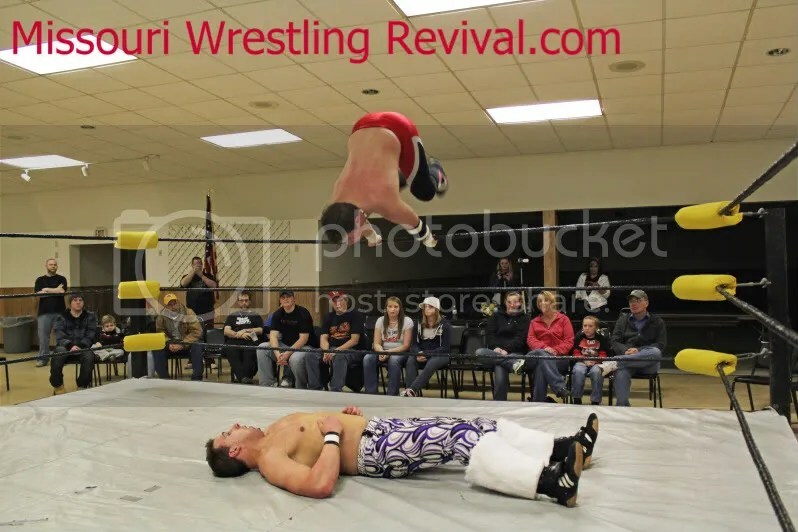 He can do things in the ring that no one else can do and it made him one of the most popular wrestlers in Saint Louis. This is a guy who is going to take the world by storm sooner than later. SLA– Summers is a icon in Texas. He has won every title and tournament there is to win. His matches with Jerry Lynn were classics and he is a corner stone to Anarchy. 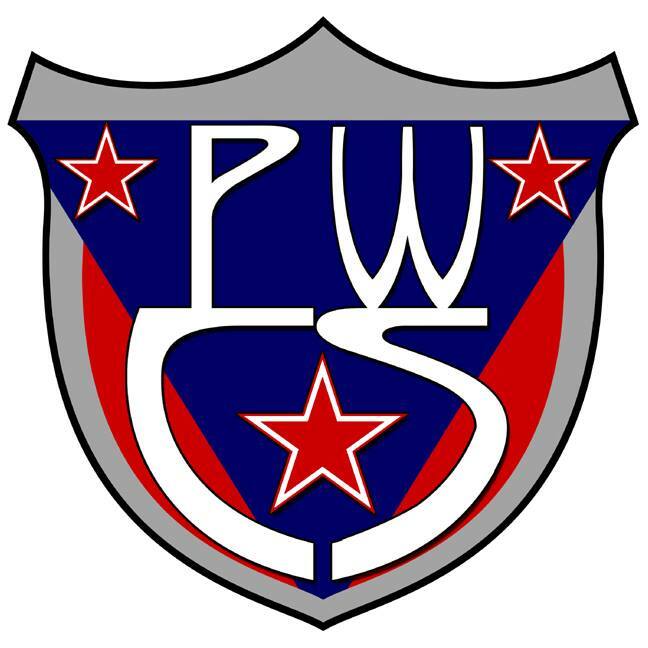 MWR– How many shows doe SLA look to run in 2011 and what venues and areas will MWR fans be able to catch all the stars in action? SLA– Right now we are looking at doing 6 shows a year. We hope to keep Granite City our home for 2012. We had great success in 2011 and if there becomes a demand for more shows we will do more. Fans if you want to see more shows you let us know..
MWR– Now let’s play a game where I say a name and you answer with one word that best describes them at SLA. Dingo works over Mat Fitchett. 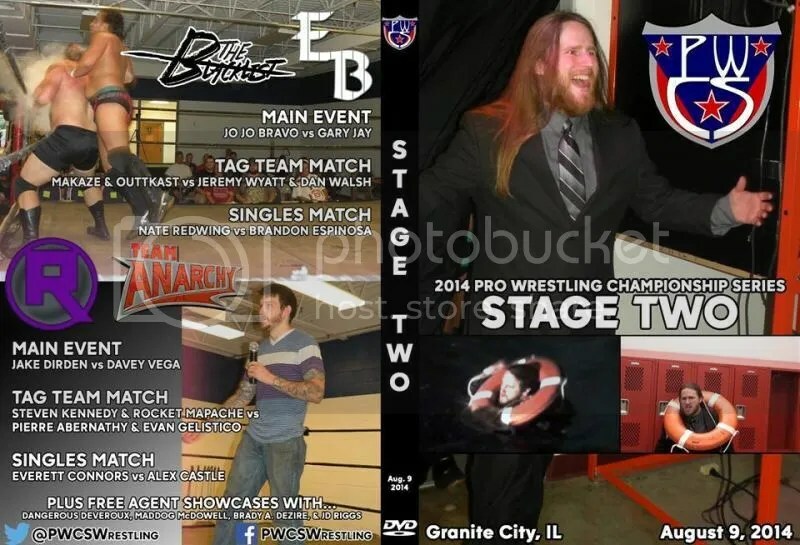 MWR– Fans can purchase past shows on DVD at Smartmarkvideo.com, if a fan was to purchase one St Louis Anarchy DVD, which one would you recommend them to choose from? SLA- I would say start with Gateway to Anarchy 2011 and follow the stories for the whole year. However if you just had enough money for one I would say Tigers Blood the Art of Winning.. The Akira Tozwa goodbye is one of the most heartfelt things you will see. MWR– We would like to thank you for joining us today and we are thrilled to add SLA to our coverage area in 2012. 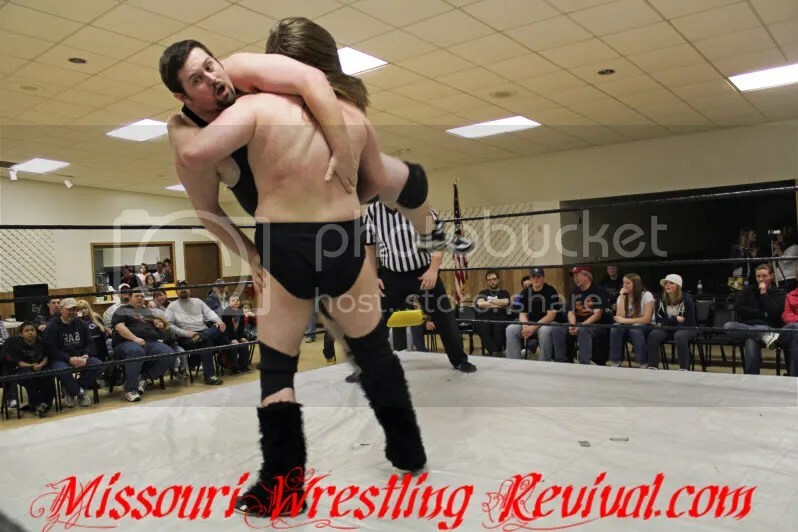 MWR fans can purchase tickets now for you’r must see show on February 25th as Darin Corbin challenges new Saint Louis Anarchy champion Dan Walsh and much more. 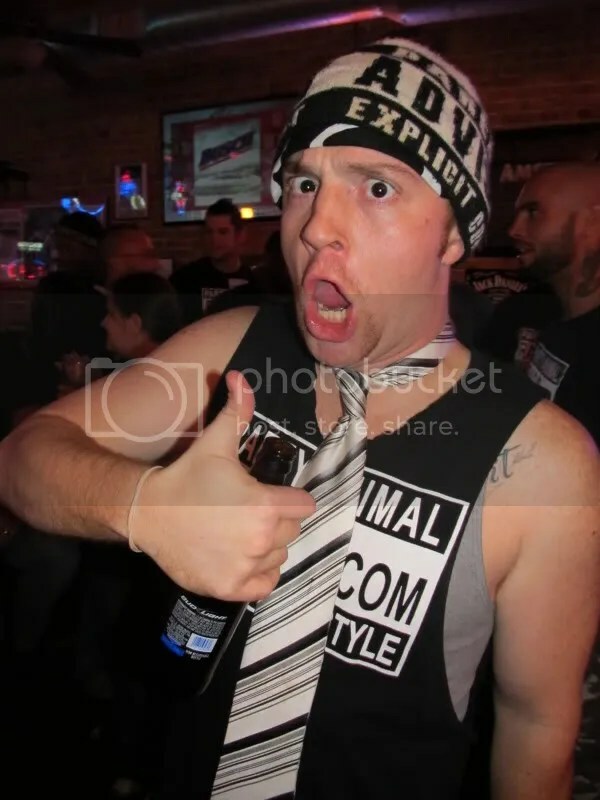 Ring of Honor electrifies ST Louis, then party like rock stars with Party Animal Radio and MWR. On the way to cover the red hot promotion in Kansas City Saturday to cover Metro Pro Wrestling I received a call from our good friends at Party Animal Radio. If anything that I have learn from the past is that when I hear from them, good times are just around the corner. 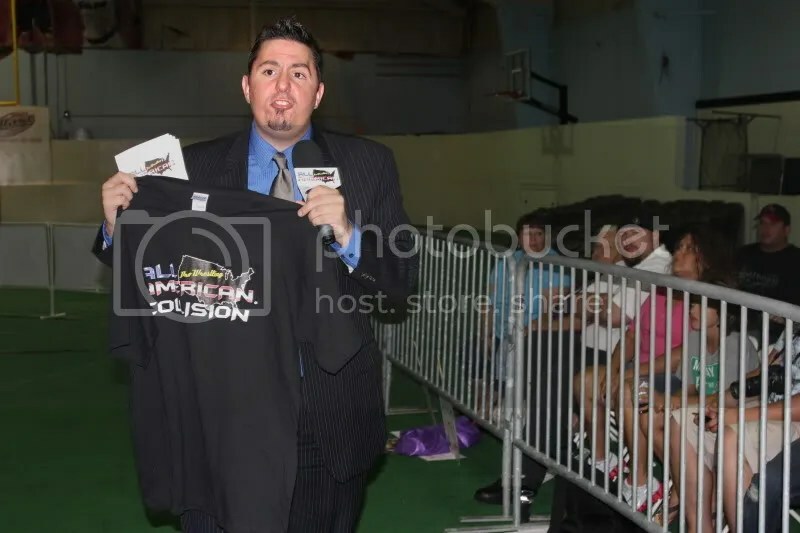 With Ring of Honor returning to ST Louis at the Collinsville Gateway Center, Dubray and I was already planning on checking out the hard hitting action with our good friend promoter Herb Simmons, Keith Smith and many other friends. After hearing, the good news that there was going to be a special MEET/GREET/AND EAT!!! With the stars from Ring of Honor! I was on the road so I got on the wire to get ahold of my good friend Kari Williams to post the news straight to MWR. For a measly ten dollars fans could have a cheeseburger and fries with the stars from Ring of Honor! Still the fans were treated to a Sunday matinée of Ring of Honor wrestling. My friends know I love wrestling but for me to miss Sunday NFL football, the show will have to be a guaranteed good time. With ROH World Champion Davey Richards announced to be in action that was all the info I need to know that the TIVO would have to tape the Denver Bronco game. 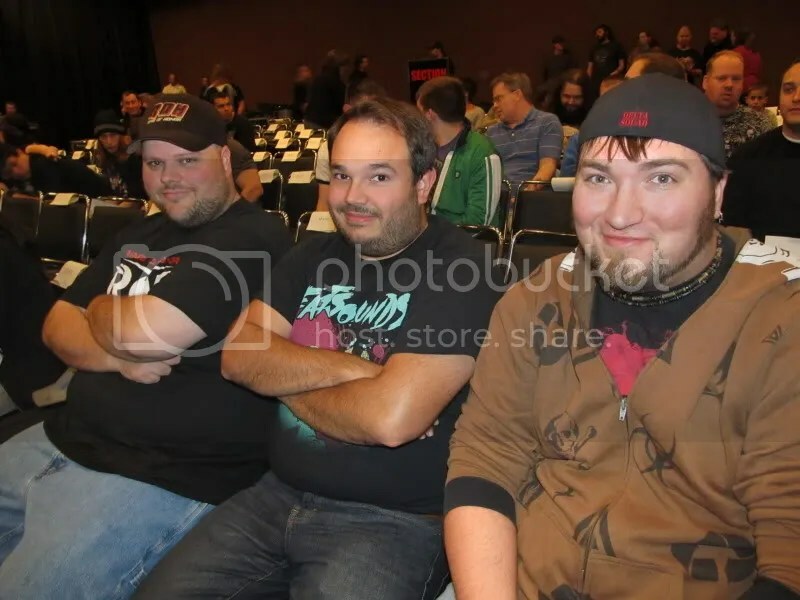 Pro Wrestling Phoenix crew made the trip from Council Bluffs Iowa to check out the red hot ROH action. 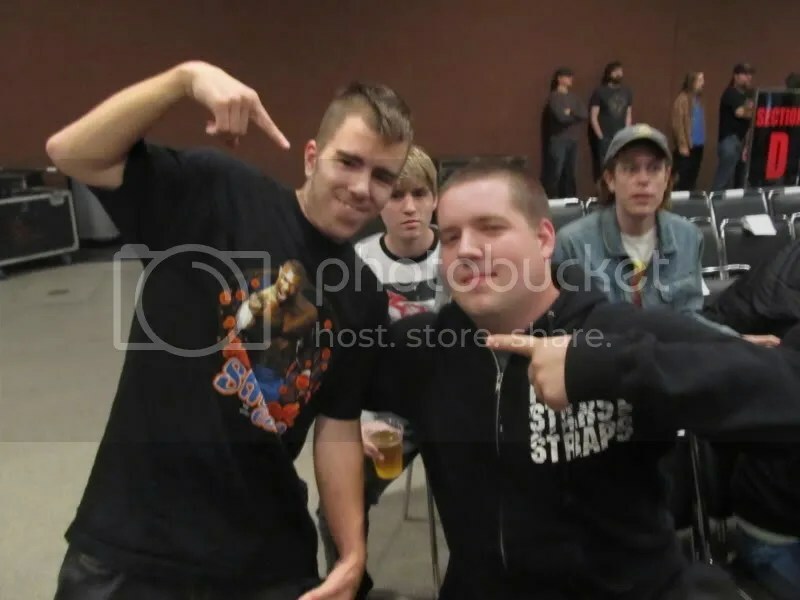 Fans have fun before the ROH show. Ring of Honor brings to the ring no nonsense, hard hitting action the way it is supposed to be. Filled with an awesome roster including the ROH Champ Shelton Benjamin & Charlie Haas formally of WWE fame as well as former TNA star and current ROH TV Champion Jay Lethal mixed in with the likes of MsChif , El Generico, Jimmy Jacobs, Steve Corino, Future Shock, Michael Elgin, and Tommaso Ciampa including a killer main event as the All Night Express (Rhett Titus and Kenny King) proved that they were real when they defeated The American Wolves (Davey Richards and Eddie Edwards). A frog splash from Rhett Titus and a shooting star press from Kenny King that allowed King to pin Edwards for the victory. Mutual respect all around after the match, but Edwards told his partner “See you at Final Battle” iPPV on December 23, 2011 – 7:30pm Manhattan Center (Hammerstein Ballroom) , New York , New York. 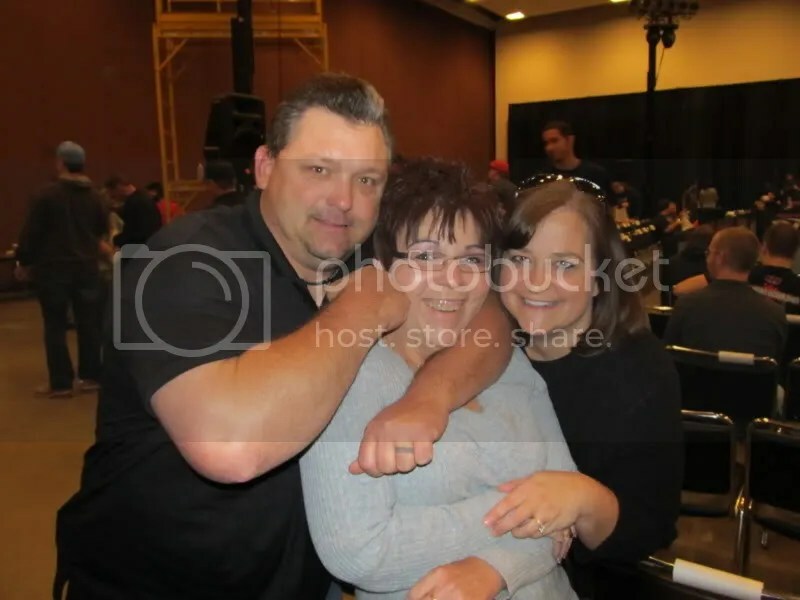 Darla Staggs is in the clutches of 25 year wrestling vet Keith Smith and his lovely wife Michelle. This coming from a woman who was live for many of the great Wrestling at the Chase shows in ST Louis’s golden era of pro wrestling is quite a compliment. I was happy to run into “ECW Original” Angel after the show, Angel is looking in awesome shape and ready to run over the competition and a ROH run for the King of the Streets would be one that I would be very interested in seeing myself. 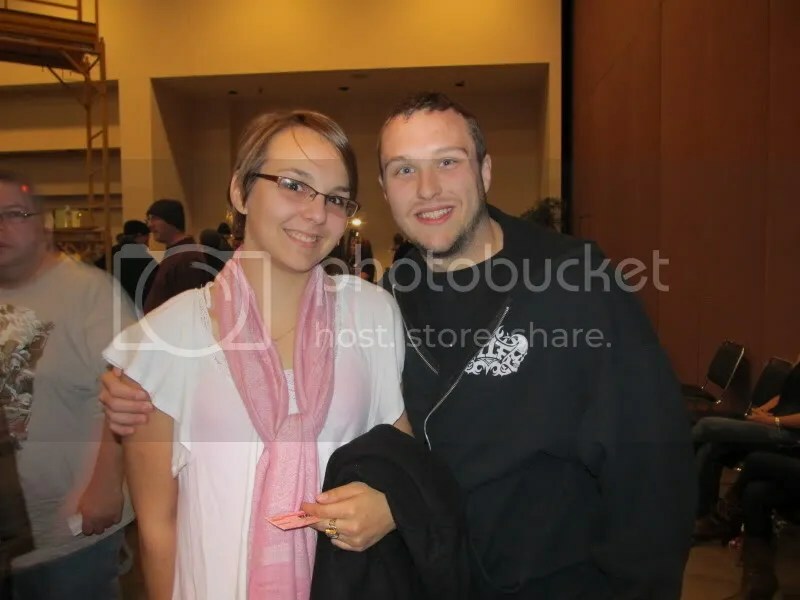 Young rising local star Aiden Young may not have a title yet but still has a beautiful women to come check out ROH with. SICW Promoter Herb Simmons was on hand to check out ROH. 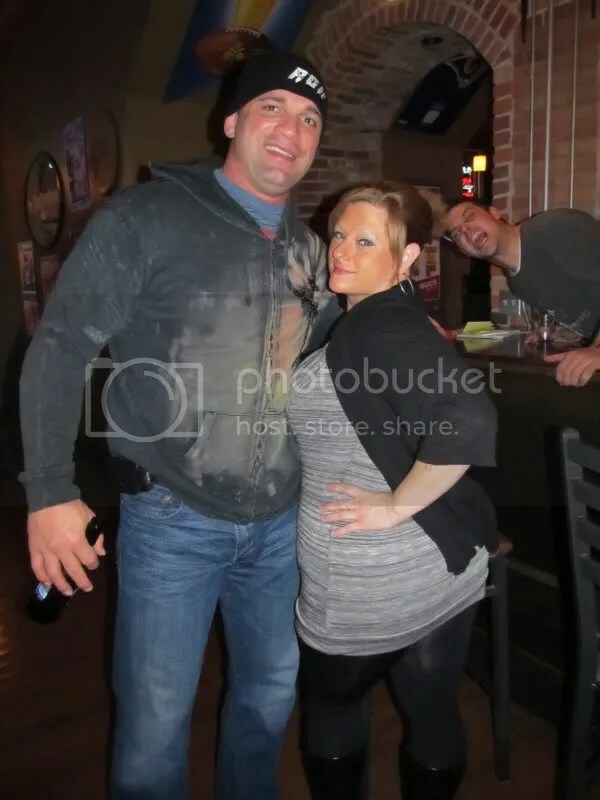 Fans can check out SICW this Saturday in East Carondelet Il along with CWC Champ Ron Powers. 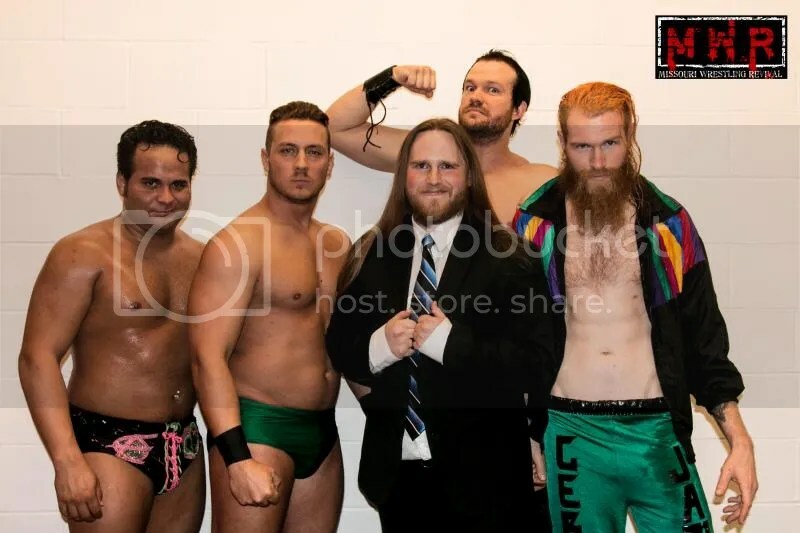 Also in attendance was one of the top tag teams today the Kentucky Buffett of Alex Castle and Matt Cage, Aiden Young former GCW Star Mike Sharona and the Manager of Champions Travis Cook. 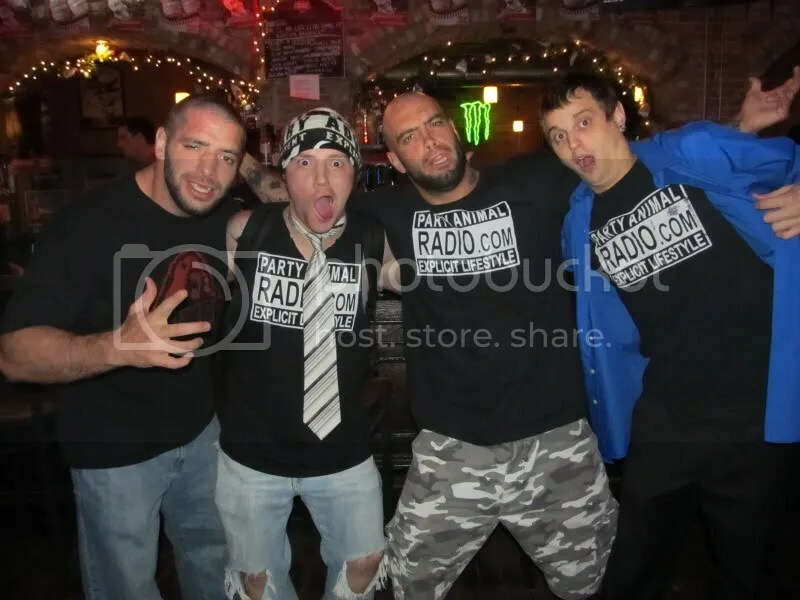 Then it was off for ROH –Party Animal Radio after party 2011, if you missed the last ROH after party click here for all the great times from 7-23-2010. 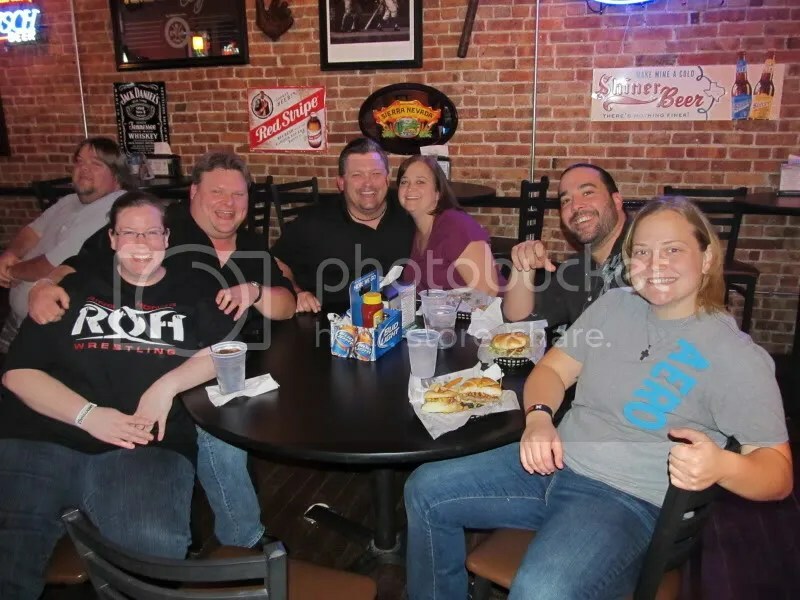 This time the party was at the 5th Quarter Bar & Grill and as usual, we got there early and sat with our friends Drew, Gary and Ben while waiting on the ROH Stars to show up as they showered and if they were like us, got lost in the big streets of Collinsville Illinois. While we waited the waiter and waitress worked hard to take the fans orders and drinks. I was stunned to hear that their special on that night was Natural Light for only $1.00, so for $22.00 I got Dubray and I 2 hamburgers and a beer, and though some of you may be thinking that “oh yuck” Natty light but I actually like it so the night was starting off right. 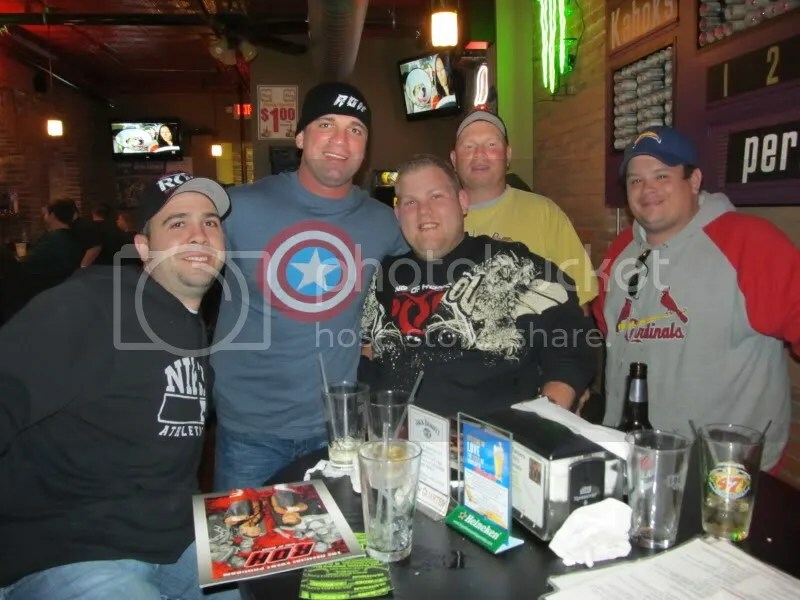 These fans traveled from Quincy Illinois for Ring of Honor and take in the after party afterwards. Here they get an awesome picture taken with the top women wrestler ever , (Of course we are 100% biased as well as correct :)) MsChif. 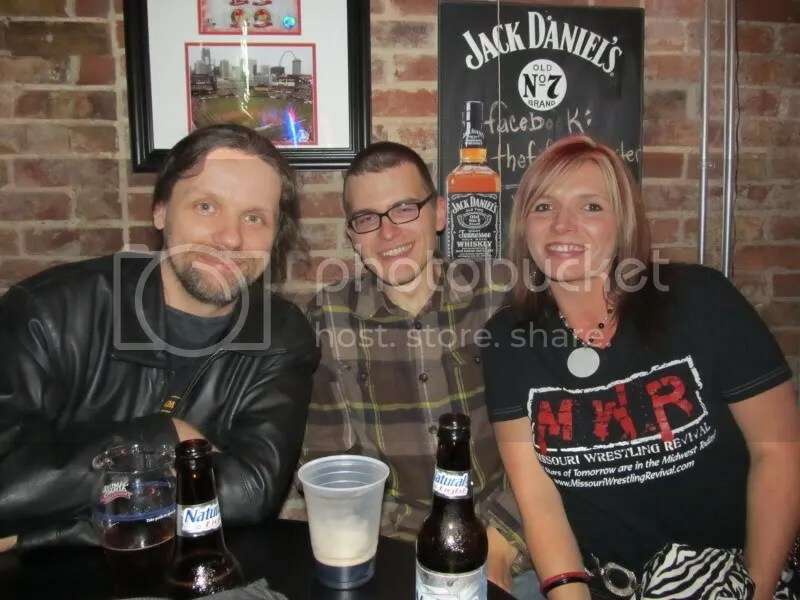 The first ROH star to make her way to the bar was MsChif, who was game for some food herself with some friends. 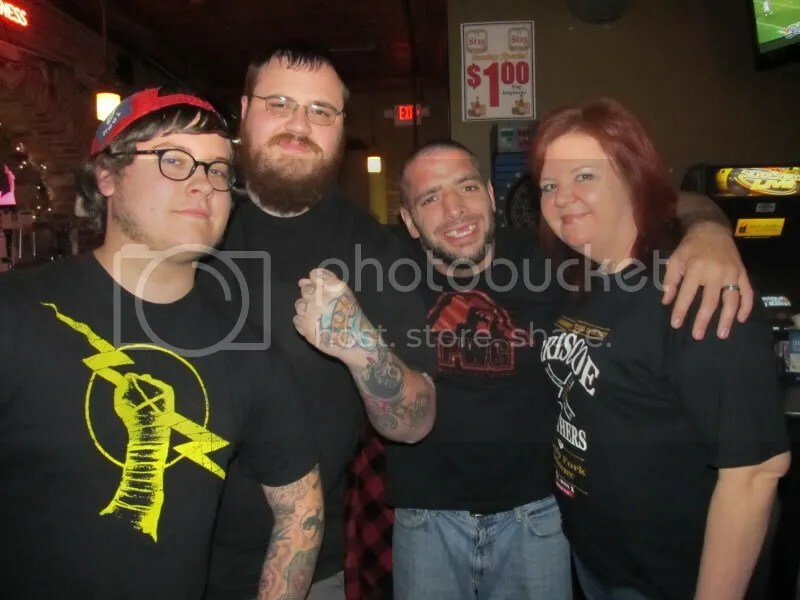 I spoke to some really cool fans that had driven from Quincy Illinois to check out ROH and was interested in getting their picture taken with Your Soul’s Tormentor – MsChif. 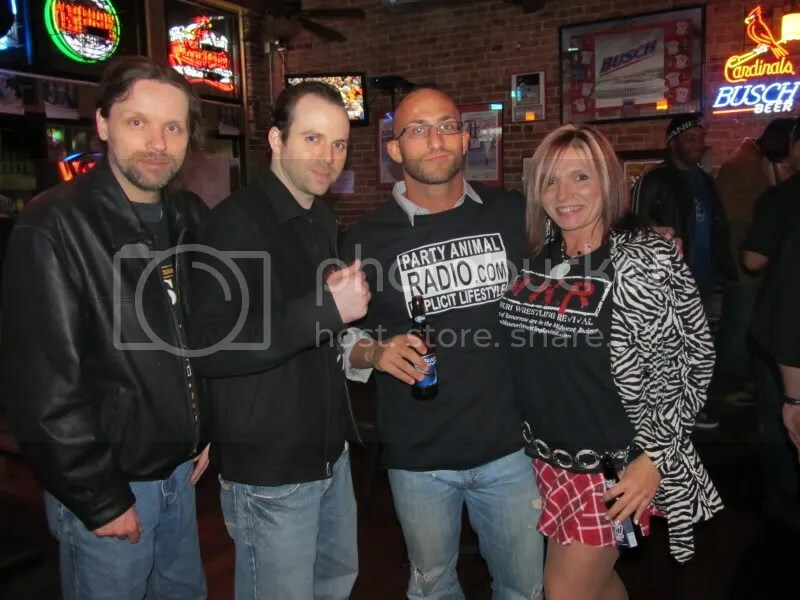 Before She left she was more than happy to take her photo with the group of friends who made their way to check her out in another win in her hometown of St Louis against Mia Yim(w/ Prince Nana, Robert Evans, & Ernesto Osiris) via Desecrator. The wrestlers takes their seats to sign autographs and take photos with some of the very best in the world today. Fans could line up for pictures and autographs with the stars such as Kenny King, Eddie Edwards, Charlie Hass and Rhett Tittus. 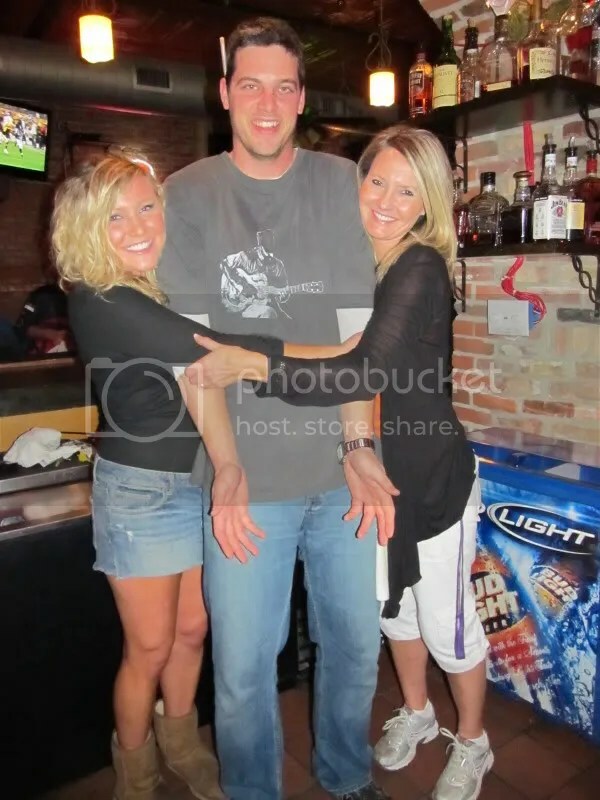 The service was awesome at the 5th Quarter Bar & Grill and the food was maybe the best that I have ever had at a small bar. When I asked the waitress who they would choose a wrestler to have their picture taken with, they quickly giggled and chose the former ROH World Champion Eddie Edwards. 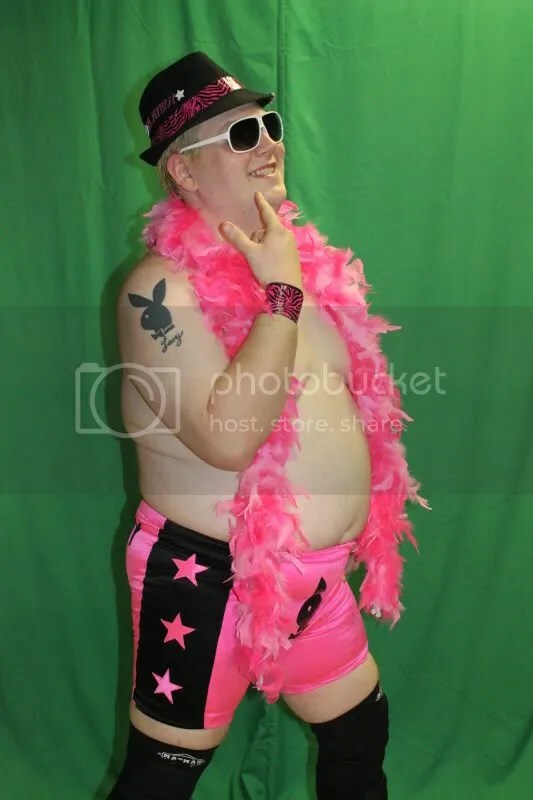 My friend Darla Staggs asked me last week at a show if I could build a promotion around one wrestler today who would it be. My answer Eddie Edwards. Edwards has the talent charisma and skills for many years to come along with one great match after another . Here he gets all the love from the girls in the house. Has Edwards met his match??? Edwards had been smiles all night with the girls,Edwards the number one contender for the ROH title played around with funny poses along with the girls for MWR. 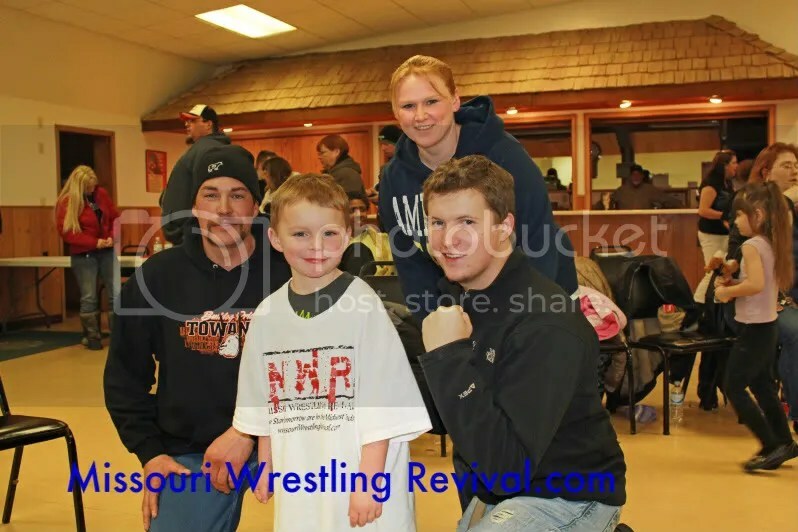 Awesome friends of MWR along with Ricky Cruz, International superstar (on the far right), see Cruz in action in East Carondelet Illinois for SICW this Saturday. At one table was our friend Keith Smith with family and friends along with rising star in the Midwest Ricky Cruz chilling out with laughs and great food. While walking around I noticed a couple that were just enjoying a beer, so I introduced myself and asked if they had ever heard of MWR. 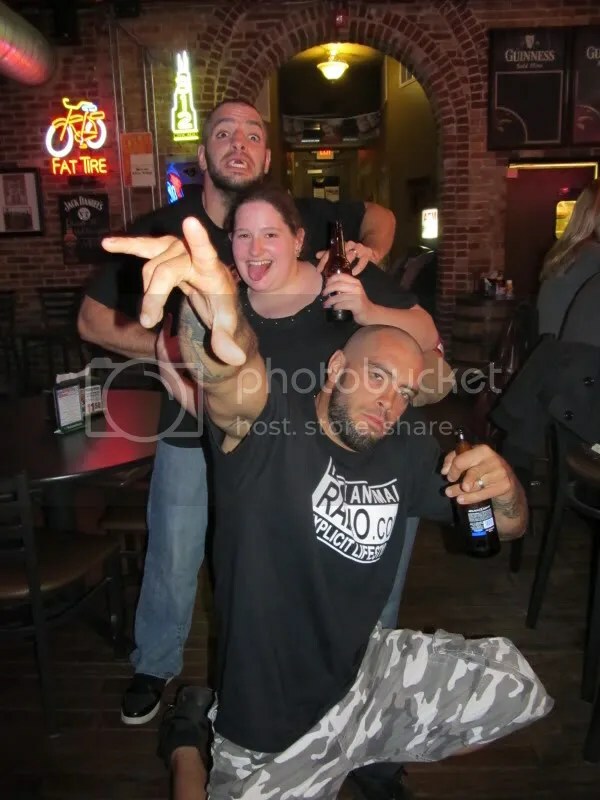 The couple stated they didn’t even know wrestling was in town and really wasn’t a fan but was kind enough to take part in the MWR Photo recap of the party. Her friend wasn’t interested in taking photos but she was able to get a photo with Charlie Hass and Delirious. Hopefully, the next time ROH comes to town, they will check out the show to see just how talented these guys were. MWR’S Dubray Tallman was even able to find local wrestling legend Poo Doo the Cow, coming out of the farm to get his drink on. I am not going to lie to you; I was amazed that there were so few fans that took the opportunity to come to this event, , but I can understand when there was such short notice on the event but it was easily the best value for your money all year. 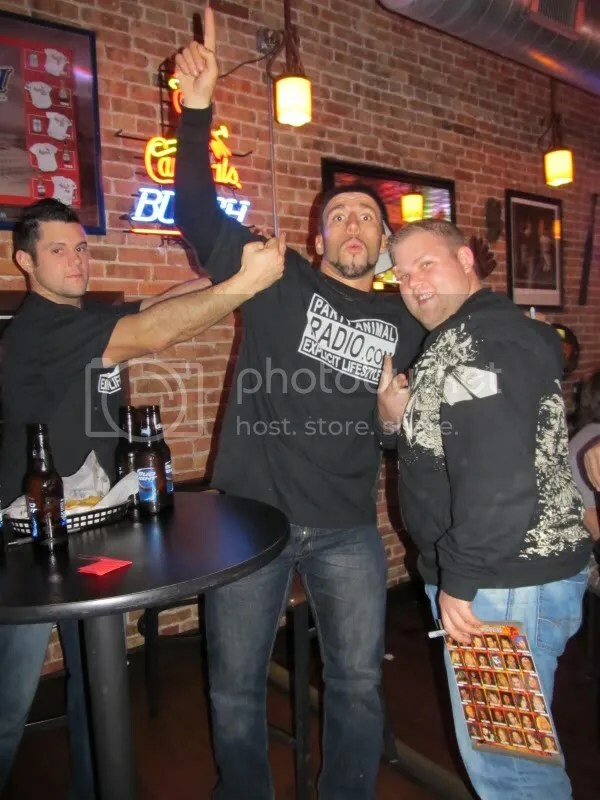 The ROH Stars even after a show the night before in Louisville, KY and less than 24 hours made their way to STL only to give a 110 percent in the ring then make their way to be kind to each and every one of the fans in that bar giving them memories that will last a lifetime. Let’s take a look at the rest of this awesome night of meet and greet with the ROH Stars and fans. 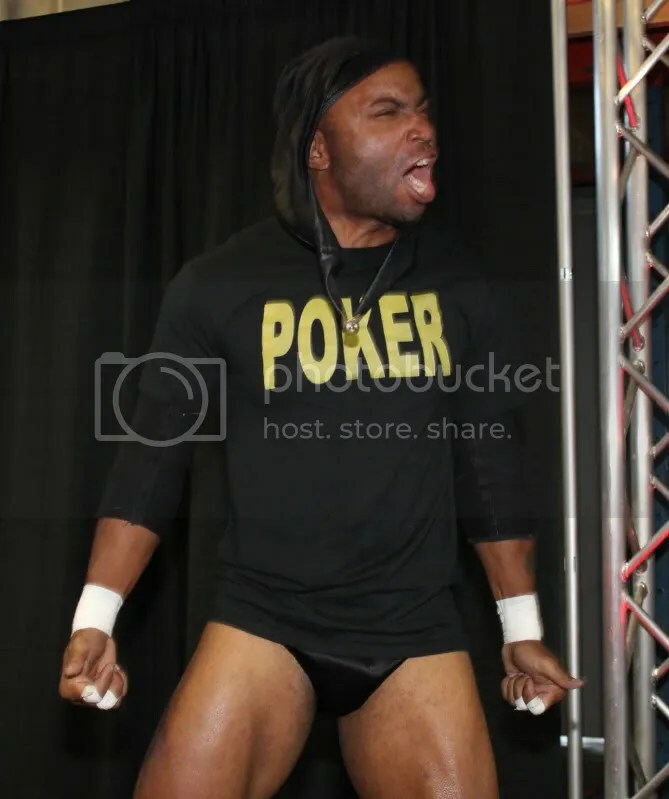 Kenny King is a name you will soon not forget, as he seemed to enjoy the fans as much as they did him. 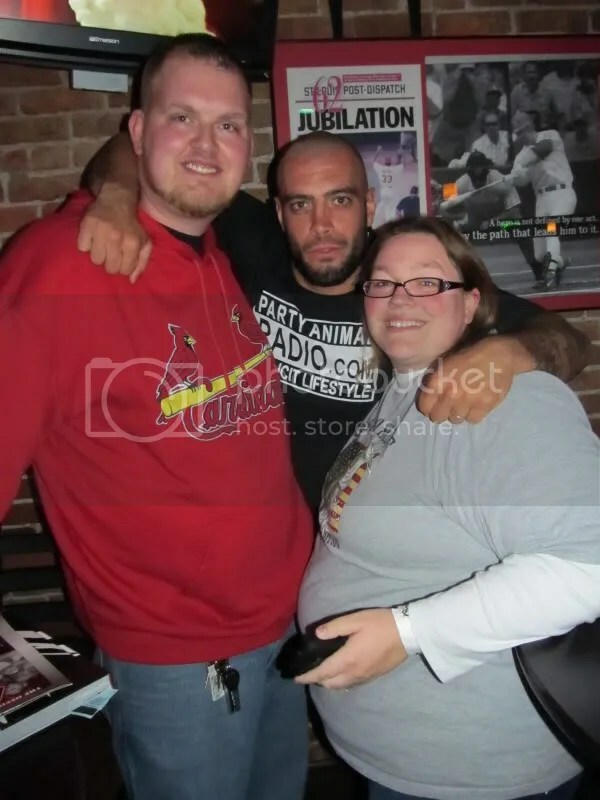 Here he poses along with one half of the party animals themselves the Briscoe Brothers. 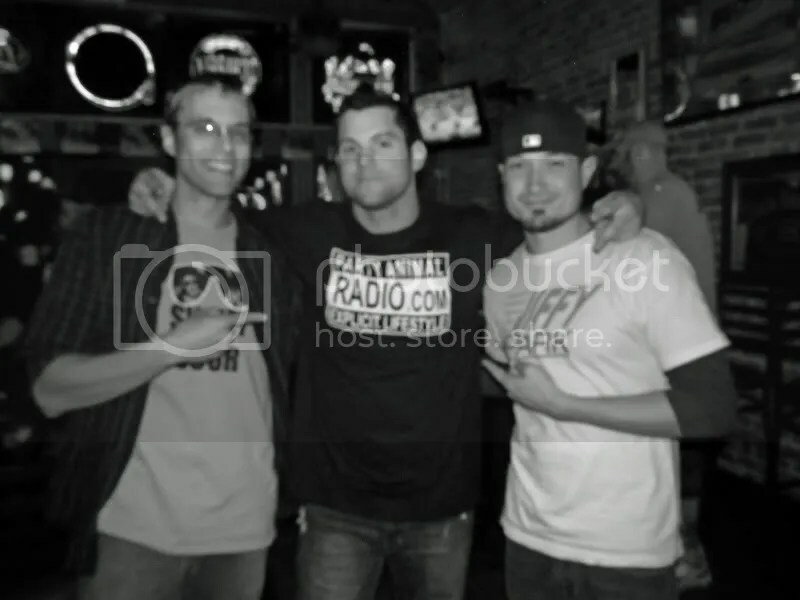 Eddie Edwards ,Rhett Titus poses with a fan in good fun. You can see comedian Louie open up for the Iron Sheik’s comedy show this Saturday. My suggestion to Louie is a T-shirt would have been cheaper, and a MWR logo would have been a hell of a lot cooler. 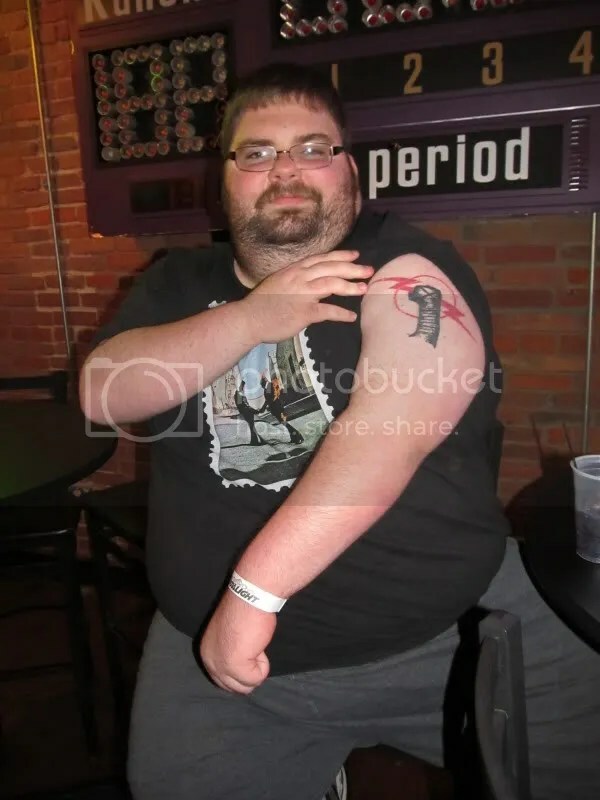 Louie and the tatoo of the World Title. Fans could have seen Tommaso Ciampa at Harley Race's WLW in the past, now he is one of top young stars at ROH. Party Animal Radio's Mike Gordon. ROH T.V. 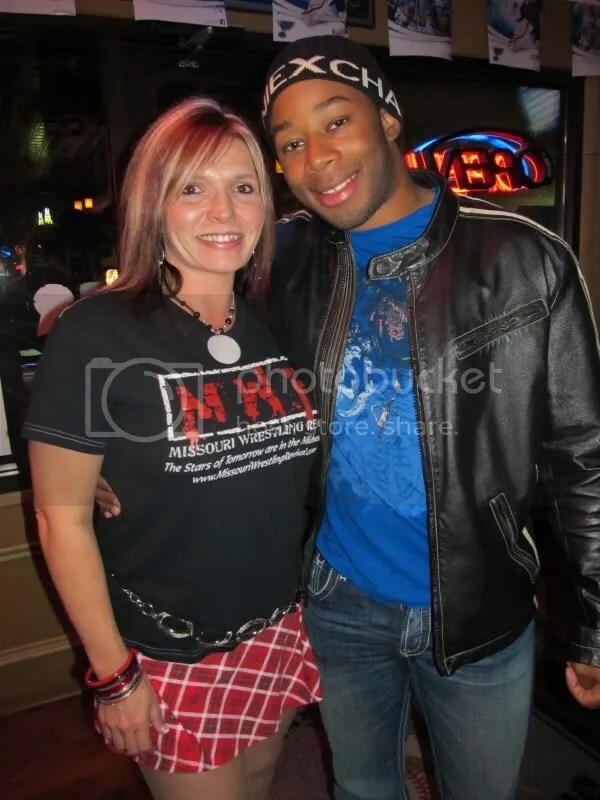 Champion Jay Lethal with the hottest girl at the bar that night, Dubray Tallman. Shelton Benjamin and one of my friends Drew. 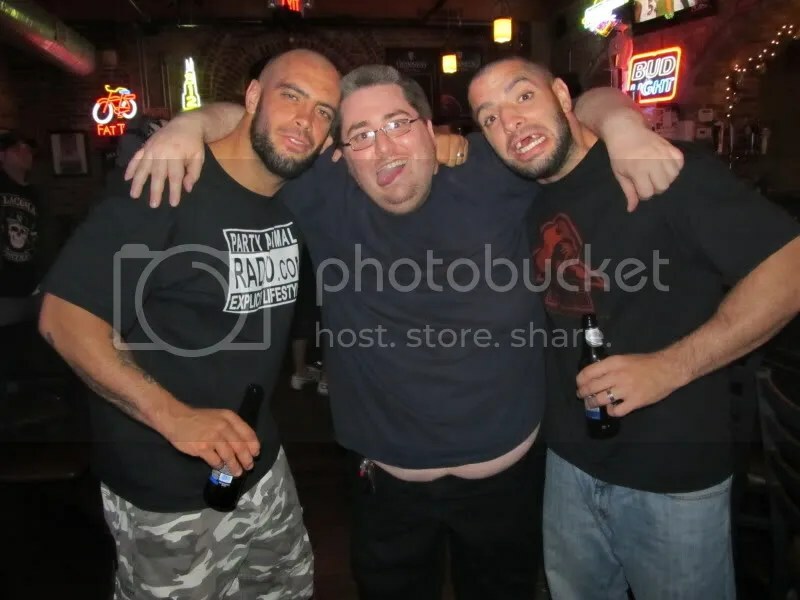 Nobody parties like Briscoe Brothers and Party Animal Radio Mike and Cody. 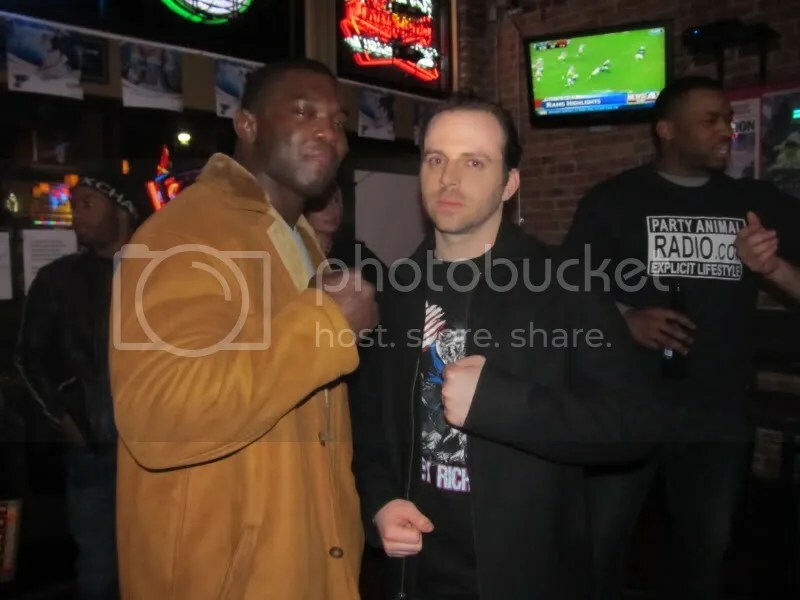 Dubray Tallman and Kenny King. 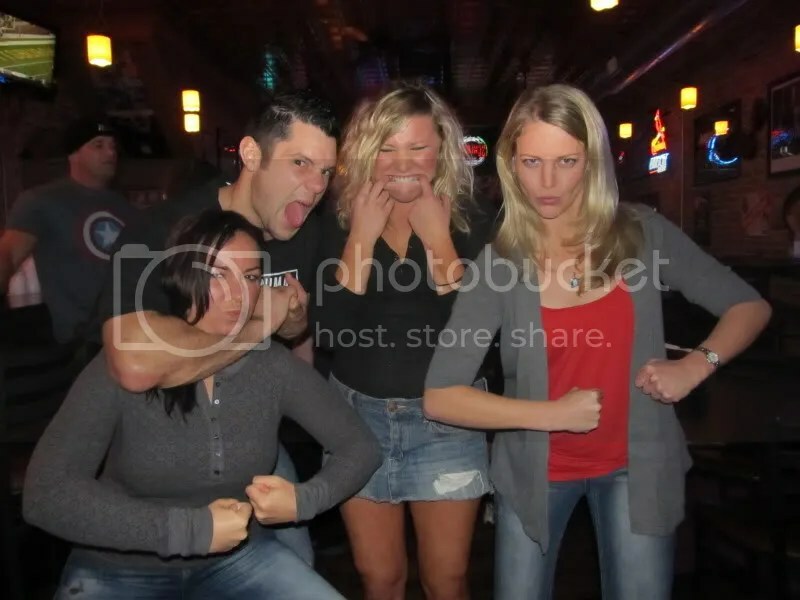 The hard working ladies of the 5th Bar and Grill. I wished this photo would of came out better sorry guys. 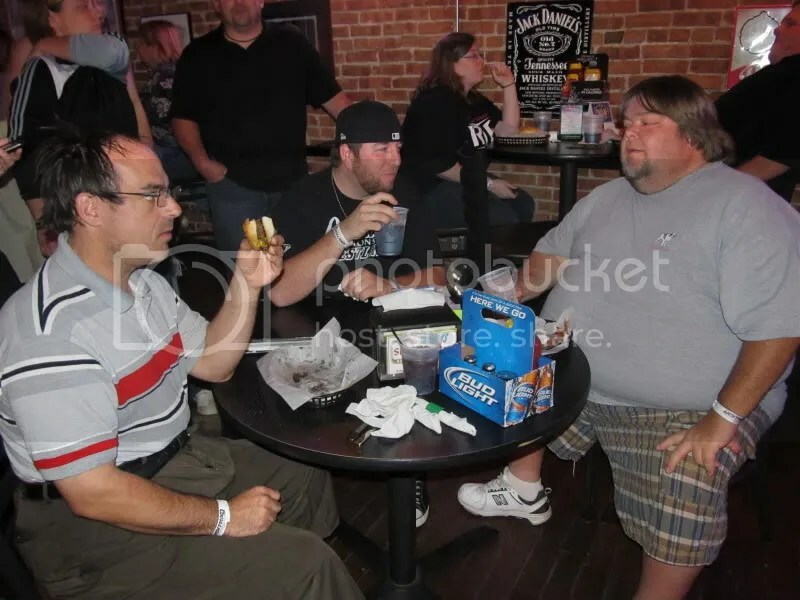 Gary, St Louis ring announcer Ben Simon and Dubray Tallman. 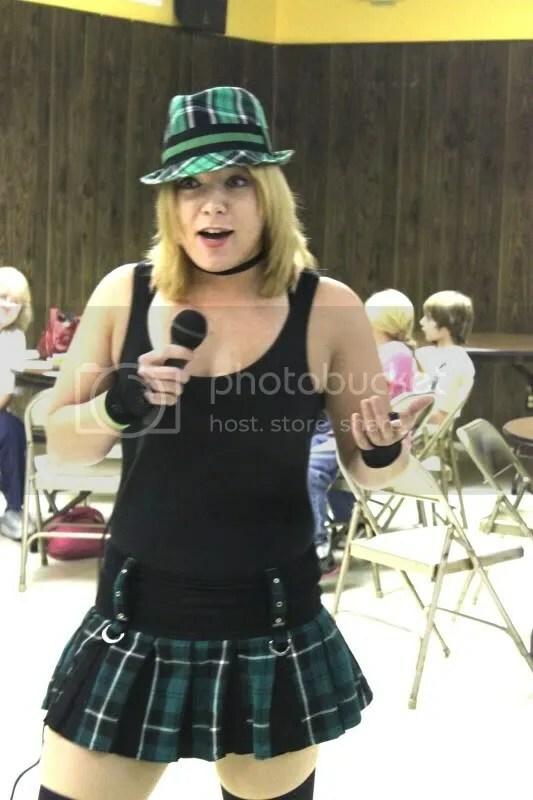 Not a wrestling fan but she was open for a lot of fun. When you need to get great service , these three bartenders are the champs. For the fans that missed this weekend’s events, you will not want to miss next Saturday as Party Animal Radio and ROSS ANTHONY PROMOTIONS have a fun filled weekend planned for you with former WWE World Champion the IRON SHIEK. For only $55.00 fans can have dinner with the Iron Sheik, fans will receive autographed photos from prior guests Tony Atlas and Harley Race free. Fans can also get a discount to the “Iron Sheik Stand up Show”, with the purchase of a “DWTL3″ ticket (you will still get the free autographs from Atlas & Race).For tickets call-314-669-4727 or 573-270-7218 or for more information visit the website at http://www.stlouiswrestling.webs.com. 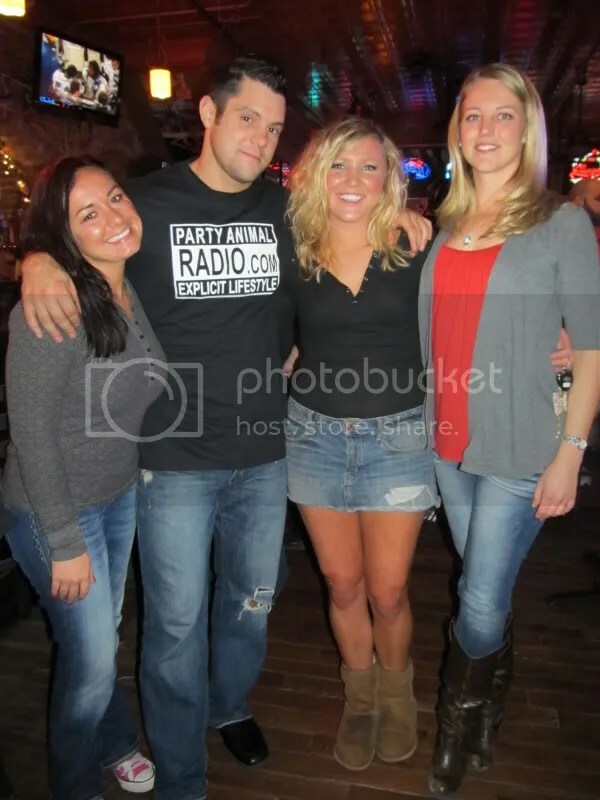 Throughout the night fans were able to purchase raffle tickets for a chance at free tickets to these events as well as Party Animal Radio t-shirts. So please join us this Saturday for the Iron Sheik meet and greet dinner. A night you will never forget. MWR Trading card #51 Jimmy Jacobs. 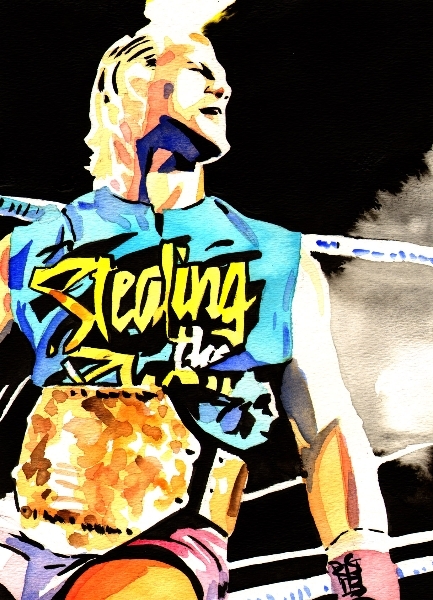 He is one of the most electrifying men in pro wrestling today. His name is Jimmy Jacobs a man who has been involved in some of the most exciting matches in Ring of Honors history. After two years of having tearing it up away from Ring of Honor, the controversial Jacobs has returned this summer to blaze a new path to his old stomping ground. Meanwhile brand new ROH World Champion Davey Richards reigns supreme after a big win defeating his former partner Eddie Edwards. Fearless and always exciting, fans have to keep their eyes glued to the match to keep up with the moves and antics of Jacobs who is one of wrestling’s great minds in the game today. #34 -U-Gene Dinsmore– Lovable fan favorite. #35– Billy McNeil– Innovating high flyer. #46 Rob Conway– 3 Time WWE Tag Champion. 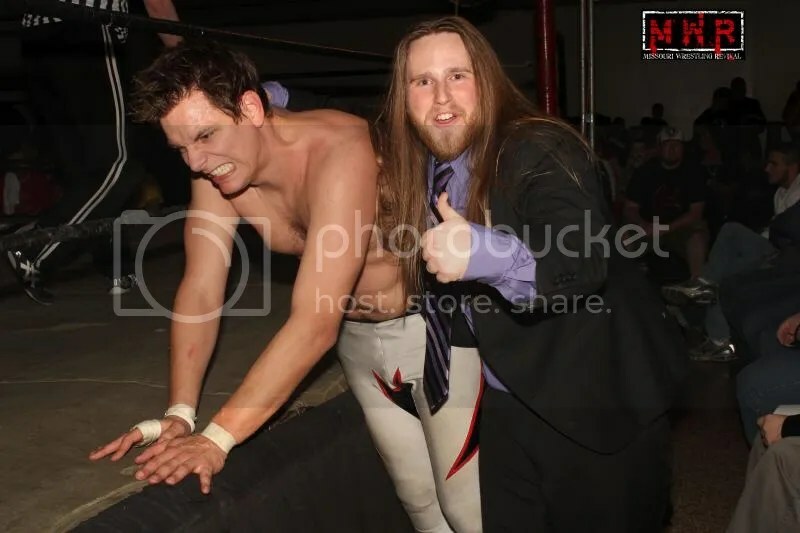 Jimmy Jacobs makes an impact- The Hooligans win more gold and Zach Gowen makes a cameo appearance in Mason Beck’s promo all at Pro Wrestling Epic. 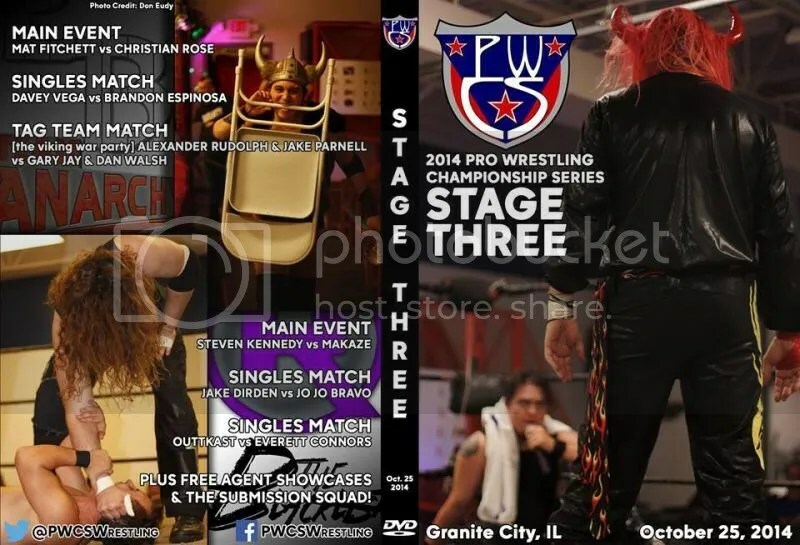 This past weekend in Mt Pulaski Illinois, Pro Wrestling Epic brought to their fans once again some of the biggest and most talented names in the sport today for an action filled evening. 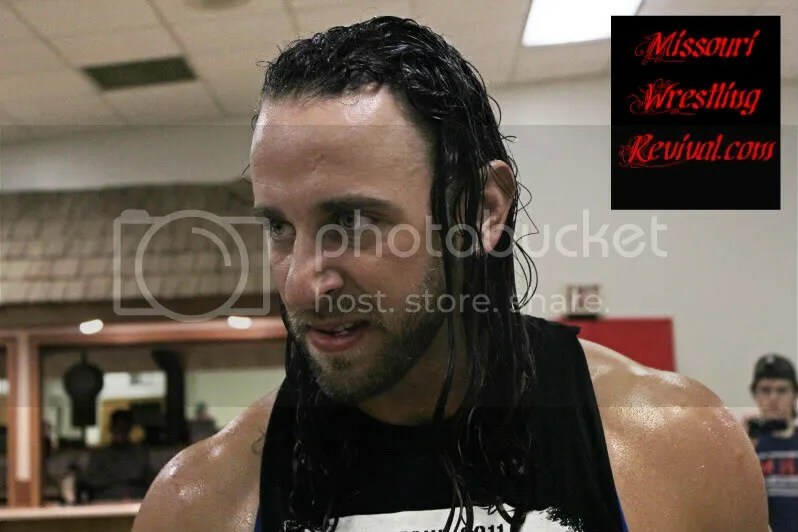 Prior to the evening MWR’S Dubray Tallman caught up with “Mean” Mason Beck to get his thoughts on his upcoming match with the PWE Champion The Mississippi Madman in a Steel Chain match….in the first of many surprises as the challenger Beck was ending his promo let’s find out which former WWE star showed up. Krotch taking down Eric Allen. 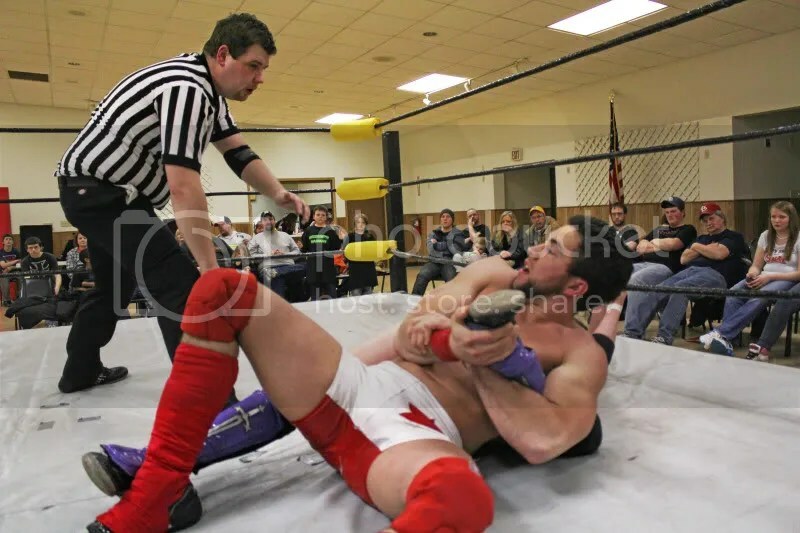 We got to see the grudge match between PWE US Champ Blake Steel and former champ Brandon Aarons. 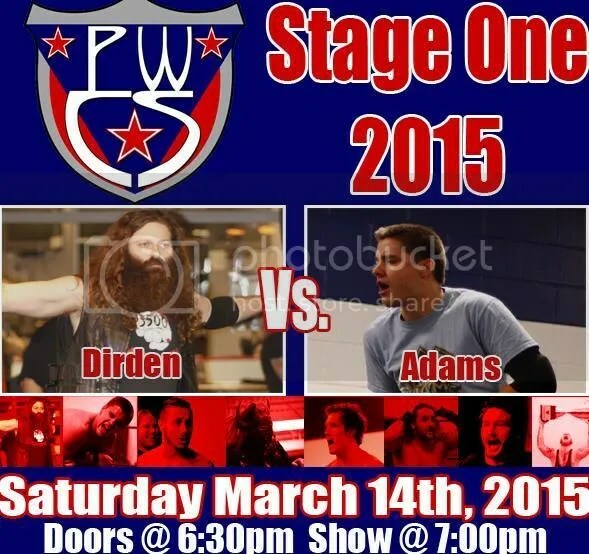 A hard hitting match that is far from over as Aarons won by DQ when Steels manager Melody interfered. Prior to intermission we were shocked to see Jimmy Jacobs, who has torn in up at Ring of Honor, , Evolve, AAW (just to name a few) came into the ring to confront Jordan McEntyre. McEntyre had came back to the ring to taunt the crowd some more for his own amusement. 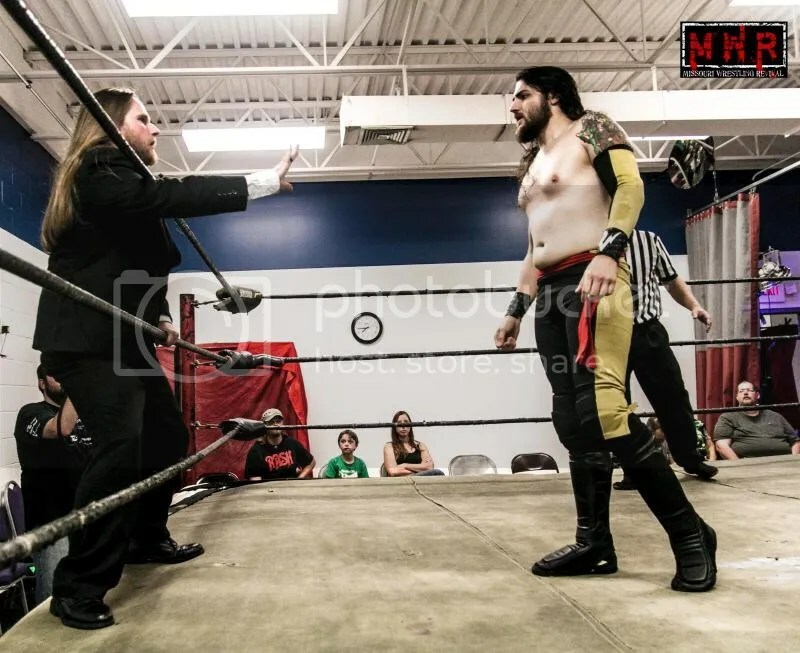 After he disposed of loud mouth McEntyre he let the crowd why in fact he was there know that he was signed for Pro Wrestling’s tournament on April 29th which has been named the Epic 8. With Jacobs signed it will be truly exciting to see who else will be signed in what could very well become something truly special. 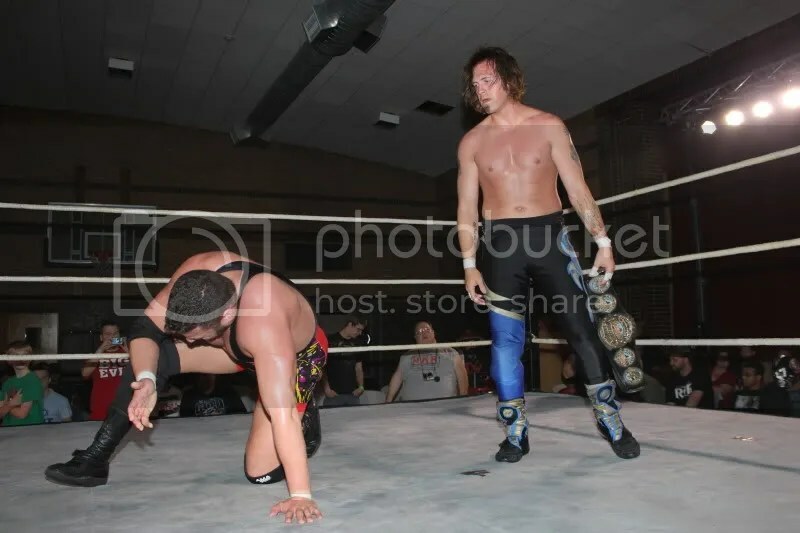 When we came back the Pro Wrestling Epic the tag team belts was vacated by former champ Mephisto and his tag partner Kurt Styles who was not in the building. 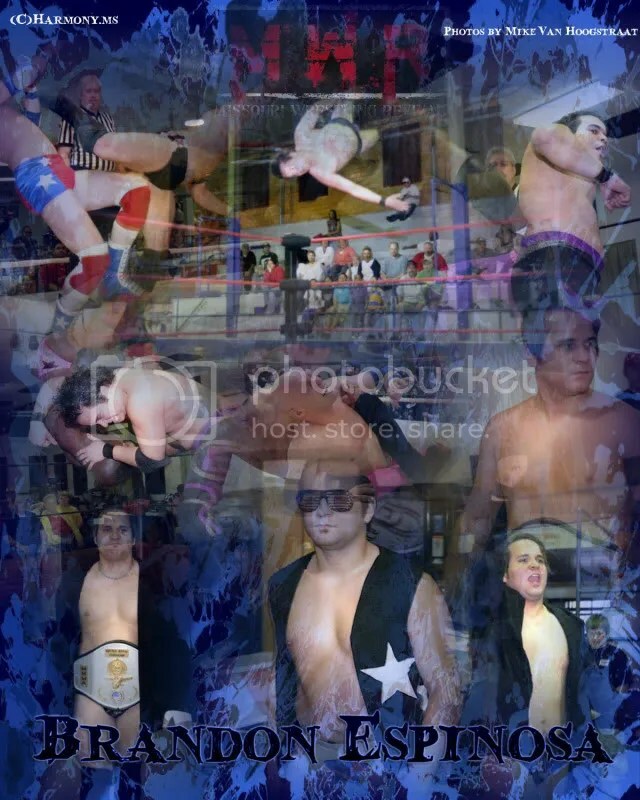 In a big match up that saw the Hooligans earning the belts in a win against Brandon Espinosa and Ace Hawkins. 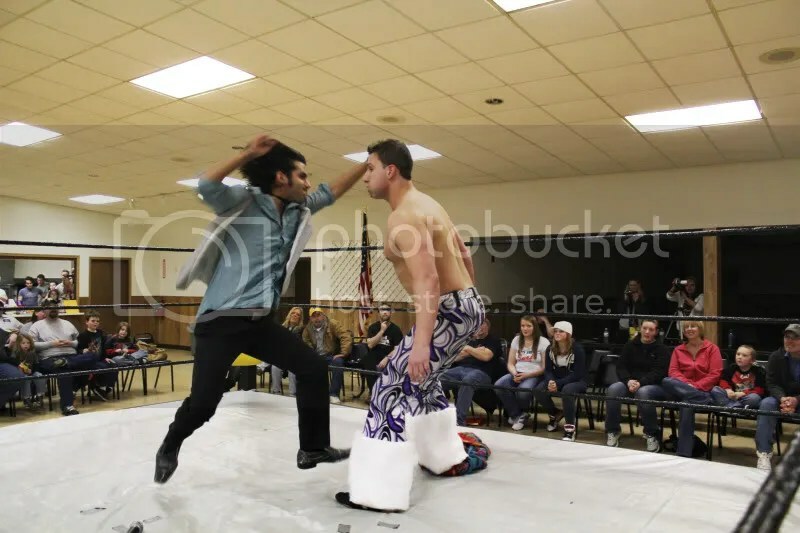 Afterwards Espinosa turned on his partner, even adding insult to injury when the Hooligans took part in the beat down on Hawkins. Once again the talented Jacobs came to the ring this time the man to feel his wrath was Brandon Espinosa. 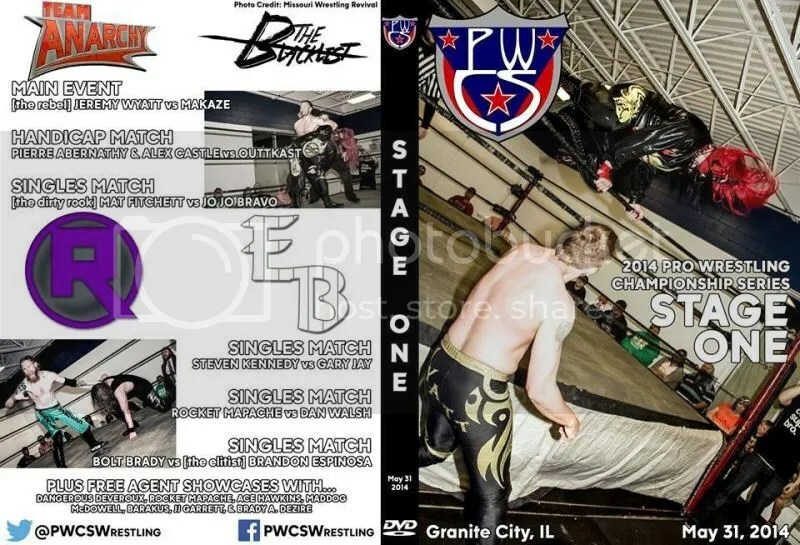 In one night the PWE fans was able to see a glimpse of what is to come on April 29th. AJ Smooth defeated a tough Knight Wagner as we geared for the main event. 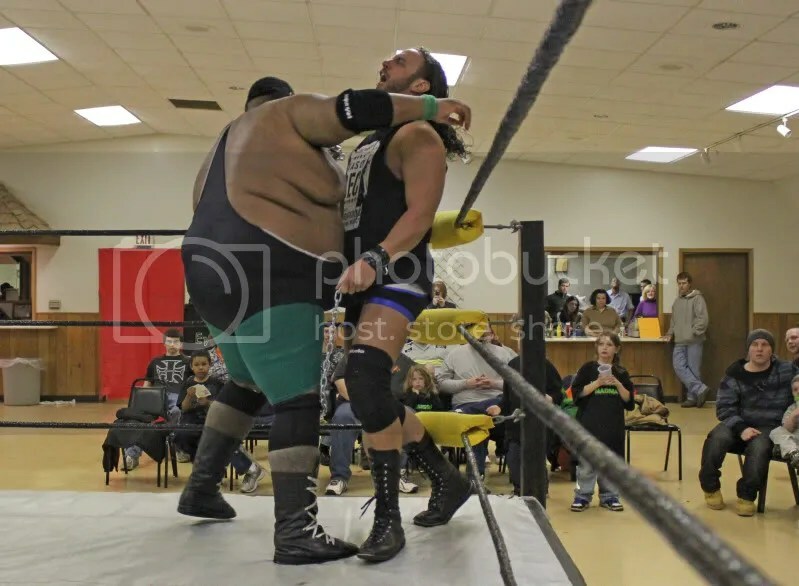 In the main event we got to see Mason Beck and the Mississippi Madman go at each other in a Steel Chain match. Throughout the match the sheer power of both men caused the chain to break loose. Blow after blow, back and forth the Madman and Beck went at it. In the end it would be the power the Madman who would stop Beck from making the final touch of the ring post and retain his PWE Championship. 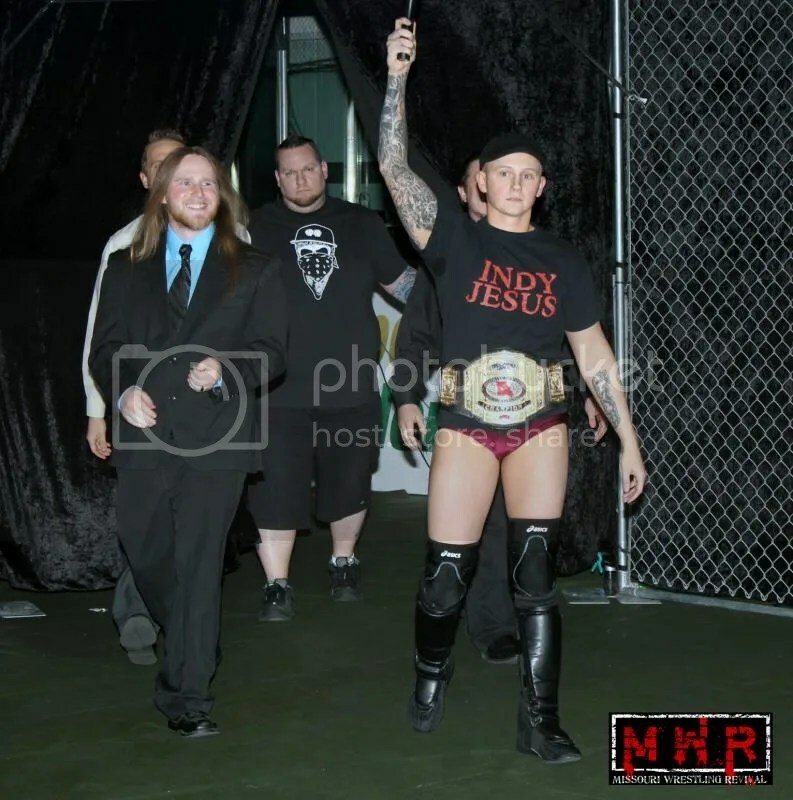 The show was over but we were far from done as the MWR Wrestler of the Night ,Evan Money had worn our t-shirt to the ring. 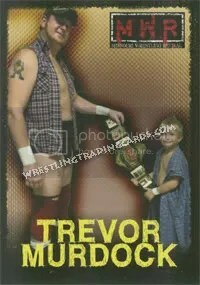 Prior to the start of his match he threw it out to the Goldman family from Bloomington, IL. Money was more than willing to take the time to meet his young fan after the show. 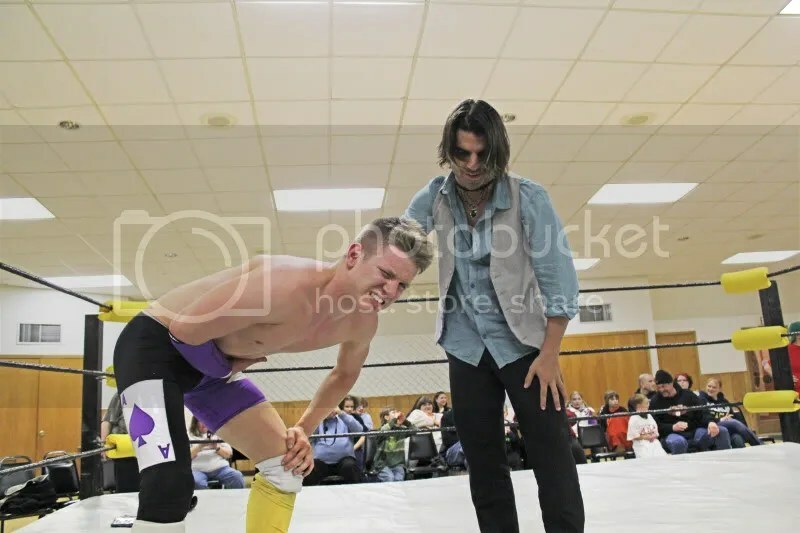 After much hard work throughout the night we were honored to get words from Jimmy Jacobs as he gave us his thoughts on Pro Wrestling Epic’s Epic 8 on April 29th in Mt Pulaski Illinois.